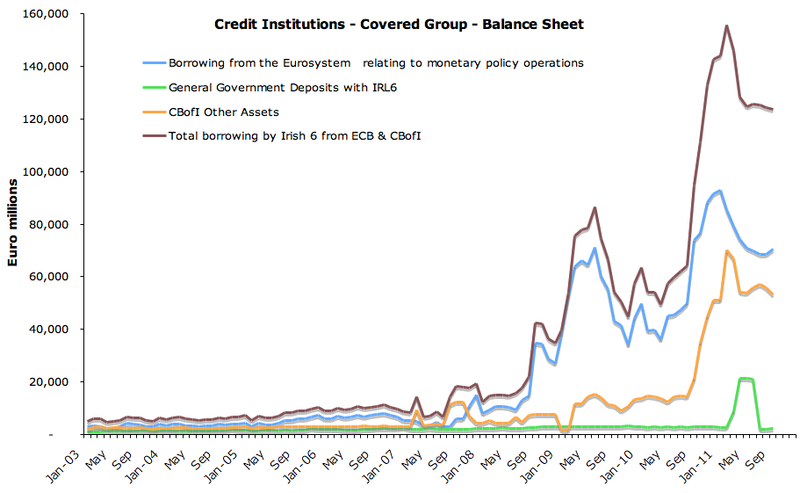 Few posts back I looked at the latest data for Irish banking system stability from the CBofI. Here, I complete my analysis by focusing on 5 covered institutions or IRL 5 (previously known as IRL 6 before the merger of Anglo & INBS into IBRC). 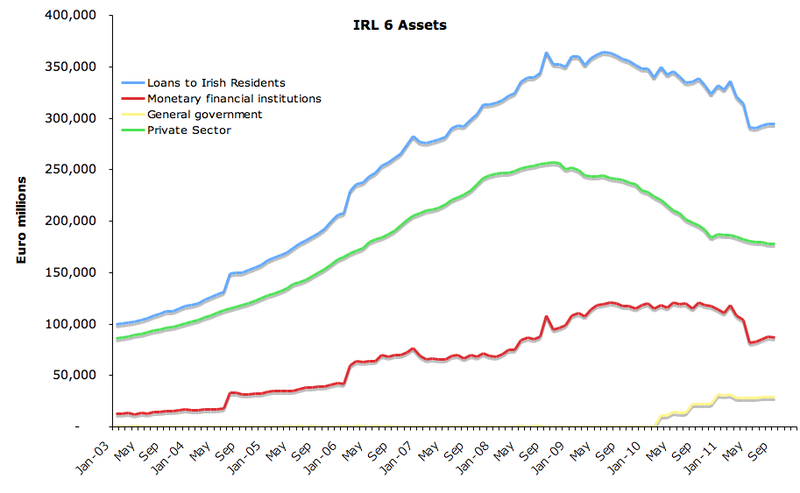 Borrowing from the euro system by IRL5 has risen from €68,430mln in August to €70,340mln in September. Year on year, this is still down 4.73% or €3,489mln, but at that rate of unwinding IRL6 liabilities to euro system will take, oh, some 20 years (!)... Mom, the increase in borrowing from the euro system was €1,910mln or more than 50% of the reductions achieved yoy. 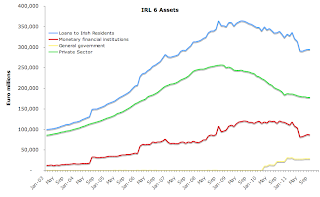 Deposits from Irish residents in IRL6 were up from €192,431mln in August to €193,929mln in September, prompting cheers from the Irish Times and Department of Finance, among others. Mom rise of 0.78% or €1,498mln contrasts a 22.22% decline yoy in very same deposits or €55,393mln loss. In other words, to get us back to September 2010 levels (not exactly healthy ones) at current rate of mom increase would take 37 months. 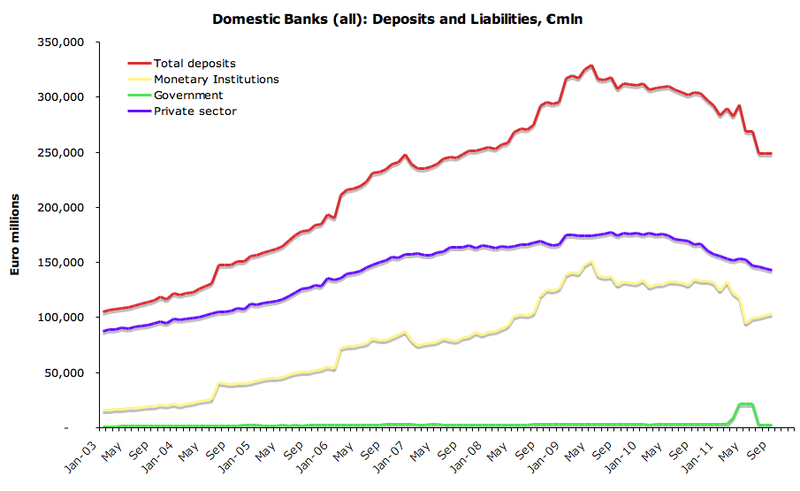 In the last three months, on average, deposits were down €26,337mln compared to 3 months through June 2011 (-12.05%). 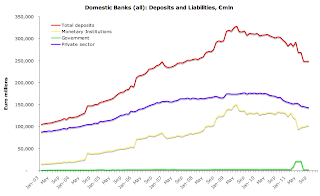 The mystery of rising deposits is explained easily by looking at their composition: Monetary and financial institutions (aka other banks) have seen their deposits in IRL5 rising €1,298mln in September (+1.47%) mom, although these deposits are down €32,308mln or -26.53% yoy. This explains 87% of the entire increase in the overall deposits. 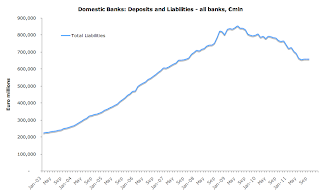 In addition, General government deposits also rose €333mln in September (+16.28%) mom, explaining the remainder of the rise in overall deposits, heralded by our Green Jerseys as 'signs of improvement/stabilization' in Irish banks. 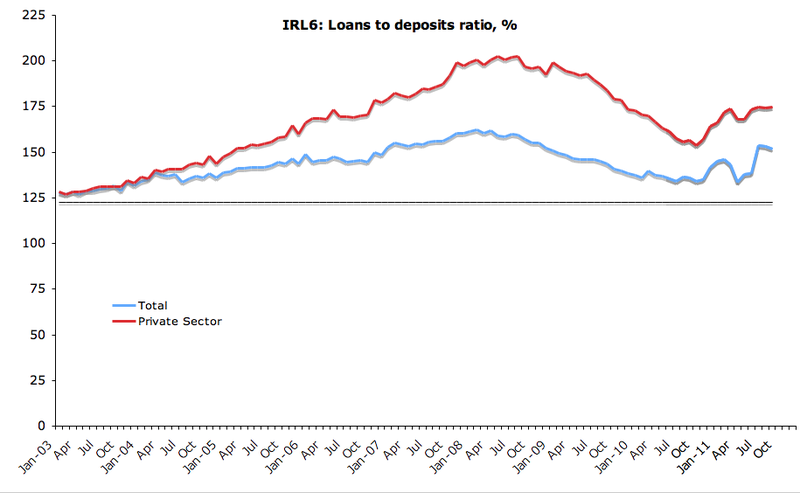 In contrast to the above two sub-categories, private sector deposits in Irish banks (IRL 5) have shrunk in September by €133mln (-0.13%) mom and are down 18.12% (-€22,589mln) yoy. 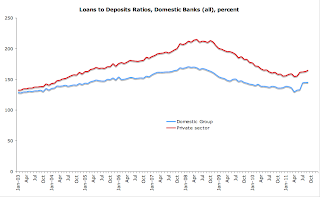 September marked 5th consecutive month of declines in private sector deposits, which have shrunk by €6,135mln since April 2011. As mentioned above, borrowings from the euro system have gone up in September. In contrast, as shown in the chart below, total borrowing from the ECB & CBofI have declined slightly in September to €123,596mln from €124,379mln in August (a mom drop of 0.63%). Year on year, the borrowings are still up massive €28,572mln or 30.7%. Over the last 3 months (July-September), average borrowings from the euro system and CBofI declined 1.39% or €1,748mln compared to 3 months from April through June. Loans to irish residents have contracted once again in September, reaching €294,224mln against August levels of €294,503. The declines were accounted by drops in loans to MFIs and increases in loans to the General Government (+€58mln) and Private Sector (+€95mln). hardly anything spectacular. 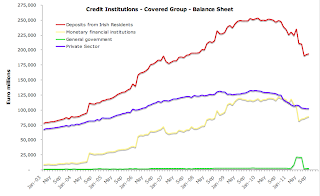 Now to the last bit - recall that the comprehensive reforms of the Irish banking sector envision deleveraging Irish banks to loans-deposits ratio of 125.5%. These targets were set in PCARs at the end of March 2011. back in march 2011, LTD ratios stood at 143.25% for all of the IRL6/IRL5 and 173.71% for private sector LTD ratio only. Since then, if anything was going up to the CBofI / Government plans, we should have seen at least some reductions in LTDs. 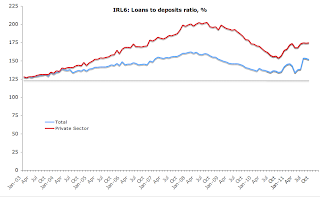 Overall LTD ratio for IRL5 at the end of September 2011 stood at 151.72% - below August reading of 153.04%, but well ahead of March 2011 reading of 143.25% and certainly much ahead of the target of 125.5%. 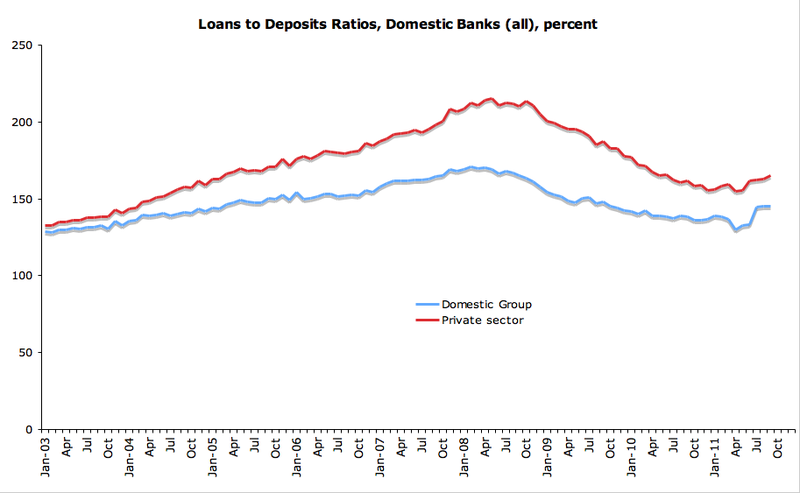 For private sector loans and deposits, LTD ratio was 174.61% in September - ahead of 174.29% in August and still above 173.71% back in March. And the summary is: there's no real stabilization or improvement I can spot in the above for IRL5. What a day this Monday was, folks. What a day. Just 4 days ago I predicted that the latest 'Bailout-3: The Gremlins Rising' package by the EU won't last past January-February 2012. And the markets once again cabooshed my perfectly laid out arguments squashing my prediction. Italian bonds auctioned last week at 6.06% yield for 10 year paper, the most since 1999. The yield was up from 5.86% at the auction a month ago which marked the previous record high. For Italy, given its growth potential and debt overhang, yields North of 5.25-5.3% would be a long-term disaster. Yields close to 6.1% are a disaster! But things were worse than that last Friday: the Italian Treasury failed to fullfil its borrowing target of €8.5bn to be sold. Instead, the IT sold only €7.9bn worth of new paper. Boom - one big PIIGSy gets it in the 'off-limits' region! Also on Friday, Fitch issued a note saying that 'voluntary' haircuts of 50% on Greek debt will constitute... eh... a default / credit event (see report here). Which kinda puts a boot into the softer side of the 'Bailout-3' deal. Boom - Greece gets it in the gut! Today, Belgians went to the bond markets and got rude awakening: Belgium placed €2.155bn worth of bonds along 3 maturities: 2014, 2017 and 2021. 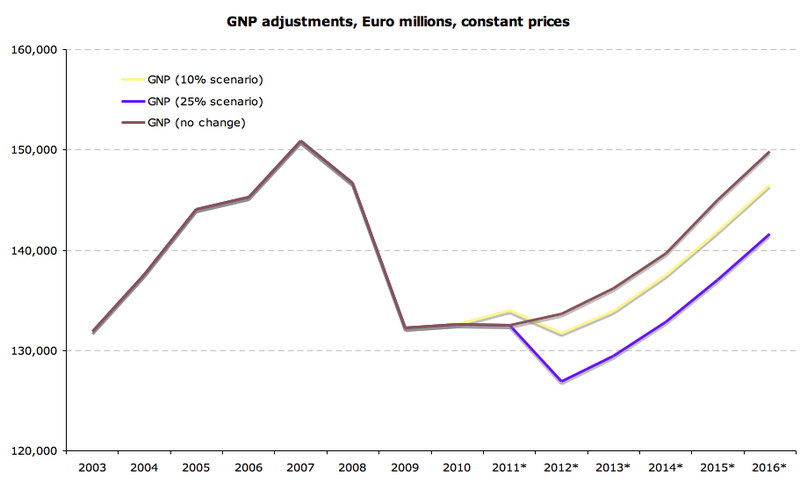 The country wanted to raise €1.7-2.7bn (with upper side being more desirable), so there was a shortfall on allocation. 10 year bond yields for September 2021 maturity are at 4.372% against 3.751% for those issued in September 2011. Belgium is yet to raise full €39bn planned for 2011 as it has so far covered €37.517bn in issuances to-date. it will be a tough slog for the country with revised deficit of 5.3% of GDP in 2012 (assuming no new austerity measures) and debt/GDP ratio of 94.3% expected in 2012. Boom - a non-PIGSy gets a kick too. Also today, Germany marched to the markets with €1.933 billion in new 12-month bubills at a weighted average yield of 0.346% and the highest accepted yield of 0.354%. On September 26th, Germany sold same paper at an average yield of 0.2418%. Today, Germans failed to allocate €67mln of bills despite an increase of 40% in yields in just 5 weeks. Big Boom - the largest Euro area economy gets smacked! And for the last one - per reports (HT to @zerohedge : see post here): Europe, hoped to issue €5 billion in 15 year EFSF bonds. Lacking orders, it cut issuance volume by 40% to €3bn and the maturity by 33% to 10 years. 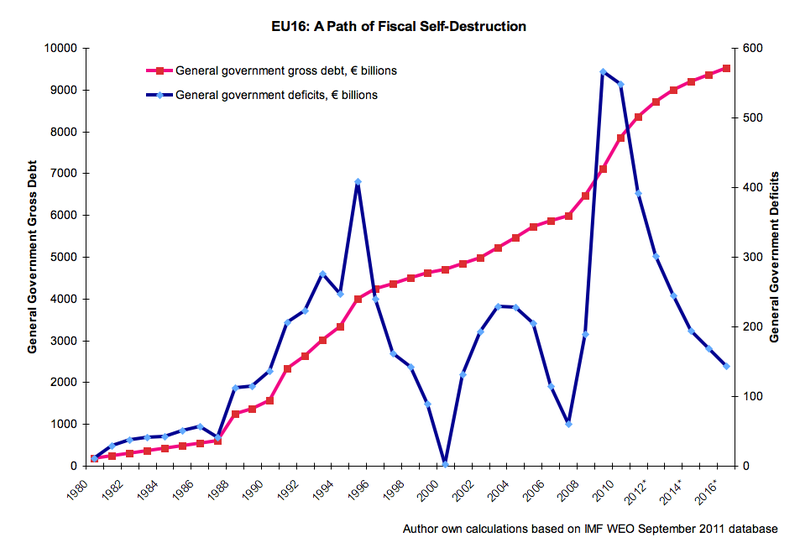 As @zerohedge put it: "But so we have this straight, Europe plans to fund a total of €1 trillion in EFSF passthrough securities.... yet it can't raise €5 billion?" Massive Boom, folks - mushroom cloud-like. 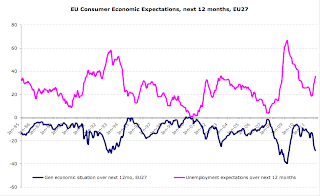 In line with the latest inflation data (see the previous post), latest data for EU27 and Euro area consumer expectations continued to move in the direction of further weaknesses. 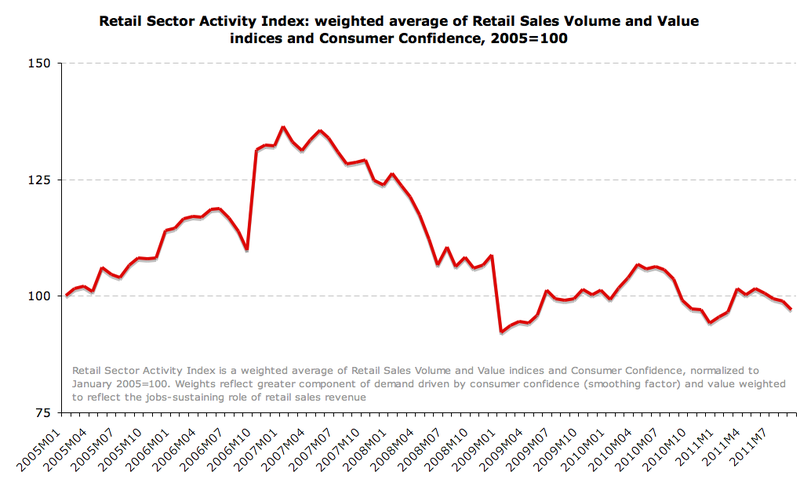 Consumer confidence fell from -19 in September to -20 in October, the lowest level since July 2009. 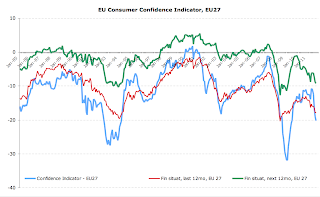 A year ago, Consumer Confidence index stood at -12. Financial Situation sentiment for the last 12 months period remained at -18 in October, same as in September, down from -17 in August. A year ago, sub-index stood at -14. Financial Sentiment expectations for 12 months ahead has also remained at -9 in October, same as in September and down on -8 in August. In October 2010 the sub-index was at -5. 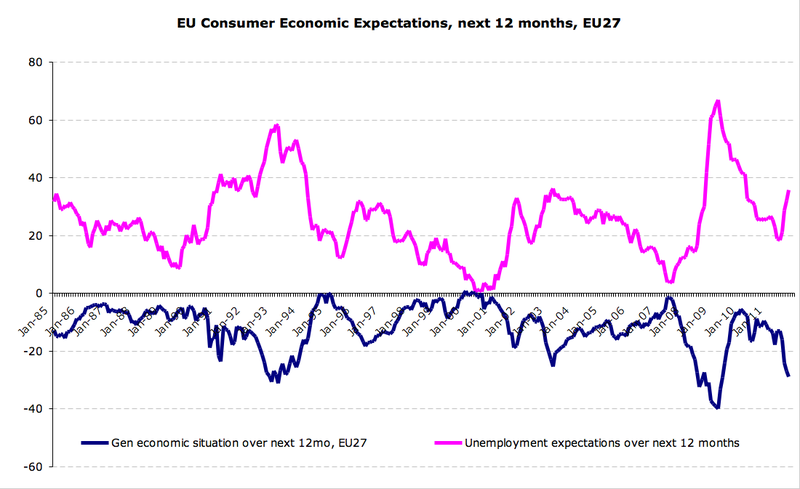 General Economic Situation perception index for next 12 months fell to -29 in October from -27 in September. The sub-index is now at the lowest level since May 2009 an is down on -12 reading in October 2010. Unemployment Expectations over the next 12 months sub-index rose from 32 in September to 36 in October - the highest level since March 2010. A year ago, sub-index stood at 26. Consumer confidence fell from -19 in September to -20 in October, the lowest level since August 2009. 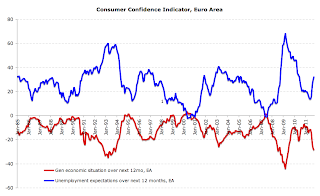 A year ago, Consumer Confidence index stood at -11. Financial Situation sentiment for the last 12 months period improved to -16 in October, from -17 in September, but still down down from -15 in April-August. A year ago, sub-index stood at -14. Financial Sentiment expectations for 12 months ahead has also remained at -9 in October, same as in September and down on -7 in August. In October 2010 the sub-index was at -6. General Economic Situation perception index for next 12 months fell to -29 in October from -27 in September. The sub-index is now at the lowest level since May 2009 an is down on -10 reading in October 2010. Unemployment Expectations over the next 12 months sub-index rose from 30 in September to 33 in October - the highest level since May 2010. A year ago, sub-index stood at 22. Much of this evidence is consistent with the latest unemployment figures reported today with Euro area unemployment up to 10.2% in September (EU27 figure at 9.7%) up from 10.1 in August 2011 (9.6% for EU27). This is an unedited version of my article in October 30, 2011 edition of Sunday Times. This week was a fruitful and productive one for Europe’s leaders. Not because the battered euro block has finally produced a feasible and effective solution to the raging debt, fiscal and banking crises sweeping across the common area, but because they spent the entire week doing what they do best: holding meetings and issuing communiqués. The latest plan, unveiled this Wednesday, shows once again that the EU remains incapable of actually doing what needs to be done. The real European disease is debt. Too much debt. 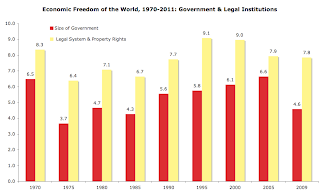 Based on the latest IMF forecasts and statistics from the Bank for International Settlements by the end of 2011, combined public, household and non-financial corporate debts will reach 280% of GDP in the US. In France, the Netherlands, Sweden and Belgium, this number will be closer to 330-335%, in Italy – 314%, in Greece – 290%, in Portugal 375%, in Spain 360%, and in Ireland a whooping 415%. The composition of these debts, and in particular the weight of public sector debts in total non-financial debt overhang, may differ, but the end result is the same for all of the above. Per August 2011 research paper from the Bank for International Settlements, combined private sector debt in excess of ca 250% of GDP results in a long term (aka permanent) reduction in future growth rates. This reduction, in turn, puts under pressure the ability of the indebted states to repay their obligations. 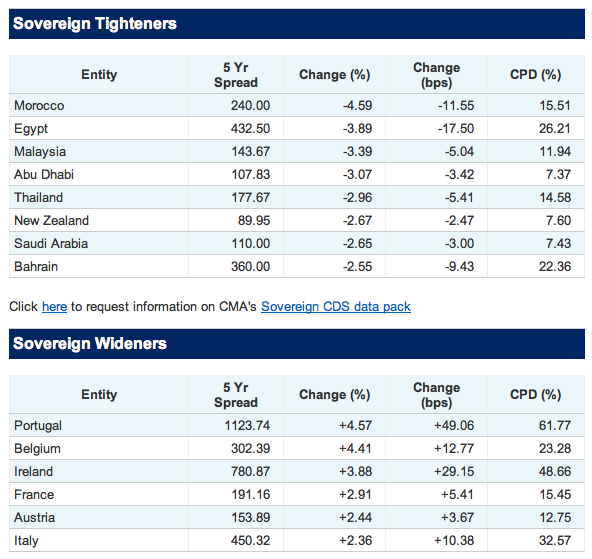 Further compounding the problem, European banking systems have become addicted to Government bonds as a form of capital. In the past, this addiction was actively encouraged by the Governments, regulators and the ECB. With the latest proposals in place, we are likely to see even more Government/EFSF debt piling into the banks in the long term. Having ignored basic risk management rules, banks across the Euro area are now fully contaminated with their exposures to sovereign bonds that are about as bad – from the risk perspective – as the adjustable rate mortgage borrowers in the US. Based on the second set of stress tests carried by the European Banking Authority this summer, Greek haircut of 75%, as suggested by the IMF, against the core tier 1 requirement of 9% will imply a capital shortfall of €180 billion. Failing to recognize this, the EU plan unveiled on Wednesday calls for just €100 billion recapitalization under a 50% haircut. This, of course is far too little too late for Greece and for Europe overall. 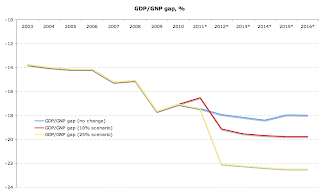 To bring public debt to GDP levels back to the point of fiscal stabilization (under 100% of GDP) will require ca 20% write-down in Portugal, 40% in Italy, and 30% in Ireland. 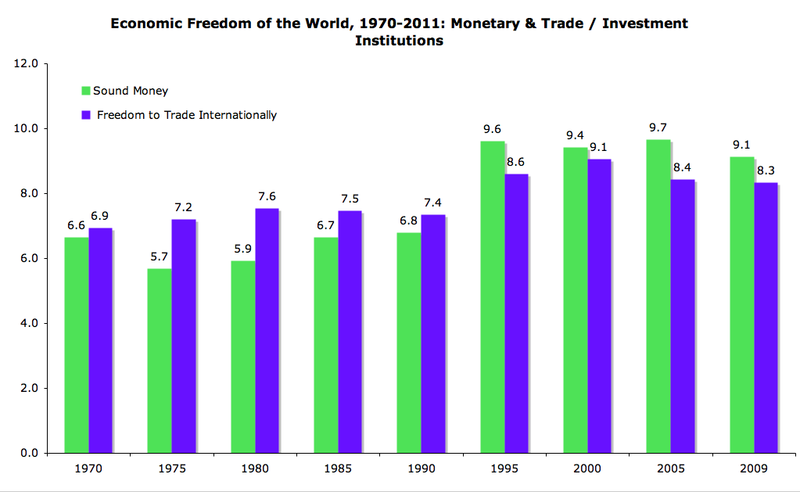 Europe’s problem is at least €730 billion-strong. It can become bigger yet if – as can be expected – Greece fails once again to deliver on prescribed fiscal adjustment measures and/or the write-downs trigger CDS calls and/or the credit contraction triggers by the measures leads to a new recession. All in, Euro area needs closer to €820-850 billion in funding in the form of both rights placements, assets disposal, and government capital supports. 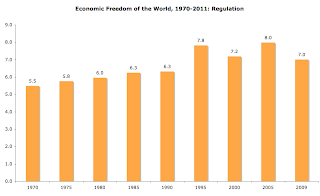 Now, factor in the second order effects of the above numbers onto the real economy. Injecting €820 billion in new capital or, equivalently, providing some €1 trillion in fresh capital and bonds guarantees as envisaged under the EFSF proposals being readied by the European officials will increase broad money supply by 10%. 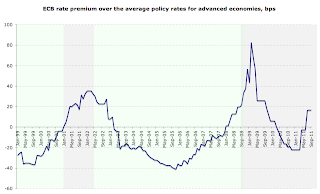 This is consistent with long term ECB rates rising to well above their previous historical peak of 4.75% - triple the current rate. European banks trying to raise new capital and deleveraging foreign assets will saturate equity markets across Europe with capital demand. Reduced banking sector competition, pressures on the margins and higher funding costs will push retail rates into double-digit territory. For European companies – more addicted to debt financing than their US counterparts and now competing for scarce equity investors against their European banks – this will mean a virtual shutting down of credit supply. Starved of domestic credit, European multinationals will aggressively divest out of the Continent and pursue jobs and investment growth in places where capital is more abundant – the US and Asia. Sadly, Krugman is correct. European cure proposals to the crises are worse than the disease itself and the Wednesday’s proposals for dealing with the crisis are case in point. Firstly, banks recapitalizations – first via private equity raising and bond-to-equity conversions, then via sovereign/EFSF funding – risks extending the recapitalization procedures into the second half of 2012 and simultaneously increase the risk premia on banks funding. In other words, credit crunch is likely to get worse and last longer. Most likely, this will require additional guarantees to ensure the funding market does not collapse in the process. The ECB balance sheet exposure to peripheral banks and sovereign debts – currently at €590 billion, up from €444 billion back in June 2011 – will become impossible to unwind. Secondly, the insurance option for sovereign bonds issuance is likely to be insufficient in cover and, coupled with greater seniority accorded to EFSF debt can lead to a rise in yields on Government bonds. This, in turn, will amplify pressure on countries, such as Spain and Italy which are facing demand for new bonds issuance and existent debt roll over of some €1.3-1.5 trillion over 2012-2014. 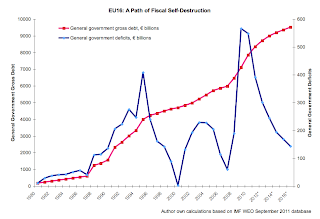 Thirdly, leveraging EFSF to some €1 trillion via creation of an SPIV (Special Purpose Investment Vehicle) will create a nightmarishly complex sovereign debt structure. Under leverage EFSF option, a country borrowing from the fund €1 billion will receive only a small fraction of the money directly from the fund itself, with the balance being borrowed from international lenders that may include IMF. In order to secure such lending, the EFSF will require seniority for international lenders over and above any other sovereign debt issued by the borrowing state. This will de facto prevent the EFSF borrower from raising new funding in the capital markets in the future. In all of this, Ireland is but a small- albeit a high risk – player with the power to influence some of the EU decisions, especially those that matter most. Alongside the EFSF reforms and banks recapitalizations, the EU will require stronger fiscal and sovereign debt oversight measures, and ultimately closer integration. The Irish Government should make it clear from the earliest date possible that Ireland’s participation in this process is conditional on three measures. 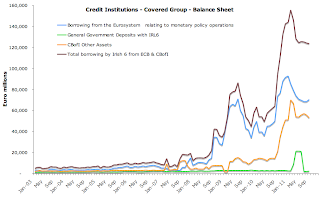 First, Irish banks debts to the euro system should be written down to the tune of €60-70 billion, allowing for clawing back some of the funds injected into banks as capital and providing a stronger cushion for a households’ debt writeoff. Second, we should demand that the debt-for-equity swaps explicitly encouraged as the means for recapitalization of the euro area banks in Wednesday agreement be applied to Irish banks. These swaps can be used to further reduce previously committed funds and reverse some of the debt accumulated by the Exchequer (on and off its balancesheet). Third, Irish Government should make it unequivocally clear that we will veto any tax harmonization in the future. On the net, European solutions unveiled this Wednesday are simply not going to work. 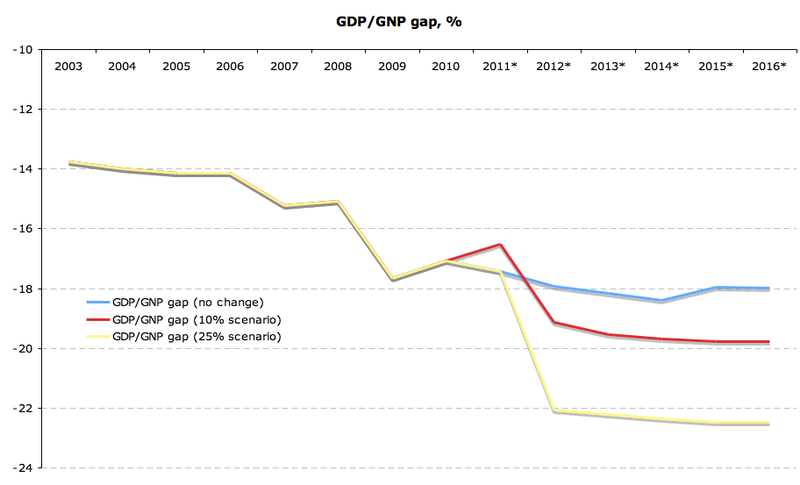 In Q1 2012 the latest recapitalization of Euro area banks and Greece will run out of steam. Next time around, this will happen in the environment of slower growth and possibly a full-blown recession with Spain, Italy and Portugal all running into deeper fiscal troubles. 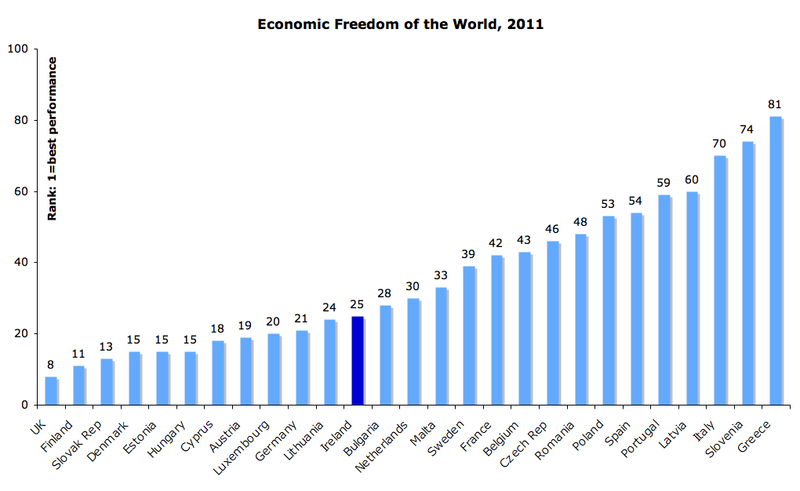 The real price of Europe’s serial failures to deal with the crisis will be the real economy of the euro zone. 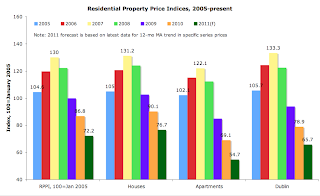 This week’s CSO-compiled Residential Property Price Index (RPPI) had posted another 1.49 percent monthly fall in house prices nationwide. 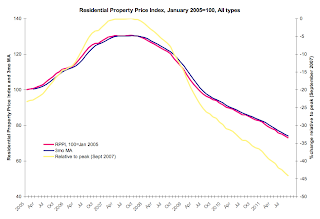 Exactly four years ago, at the peak of residential property valuations, RPPI stood at 130.5. At the end of September this year, the index was just 72.8 or 44 percent below the peak. The misery of falling prices is now impacting not only hundreds of thousands of negative equity mortgage holders, but even the all-mighty Nama. Nama referenced its original valuations of the assets it took over from the banks to November 30, 2009. 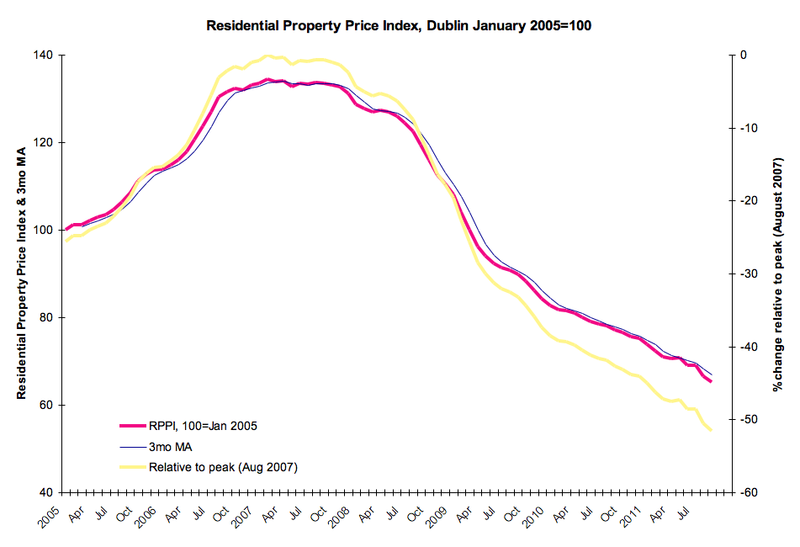 Since then, residential prices in the nation have fallen 29.5% and apartments prices (the category of property more frequently related to Nama loans) have fallen 33.9%. All in, Nama will now require a 35% uplift on its assets (55% for apartments) to break even, not including the organization’s gargantuan costs of managing its assets. Euro area preliminary inflation estimate came in today with October reading at 3.0%. 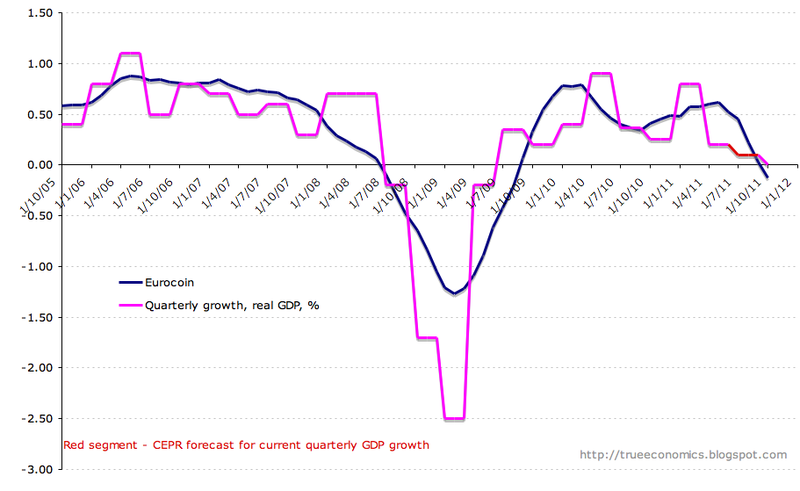 This is the second month in a row with inflation anchored at 3.0% and coupled with the signs of a recession (see charts below showing eurocoin leading growth indicator for October at -0.13, signaling contraction in economic growth) we are now in the stagflationary territory. You can see the dramatic deterioration in inflation-growth dynamics year on year in the chart above. The chart below shows updated 'optimal' inflation-consistent zone for ECB rates at over 4.0% against the current rate of 1.50%. 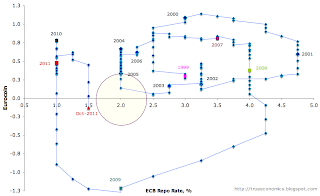 The above suggests that the ECB is now boxed into the proverbial stagflationary corner - lowering rates to improve growth outlook will risk pushing inflation even higher, while hiking rates or even staying put at current rates risks continuing deterioration in growth fundamentals. Is Irish banking sector getting slowly better - as numerous articles, including in the Irish Times are suggesting on the back of the Central Bank data for September, or is it getting worse slower? 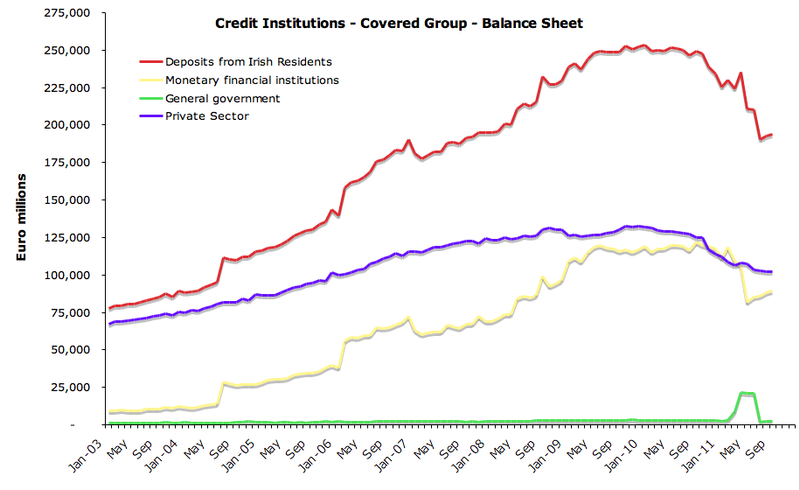 Consider CBofI data for 18 banks, plus numerous credit unions operating in Ireland. In this post we shall cover the entire domestic group of banks, with IRL6 guaranteed domestic banks to be covered in the follow up post. Total system-wide liabilities in September 2011 stood at €659,387 mln or €895 mln up on August, but €108,011 mln down on September 2010. So mom we are up 0.14% while yoy we are down 14.07%. Over the 3 months July-September 2011, there were on average €10,704 mln less in liabilities in the system than in the 3 months from April through June. Nothing to conclude about the 'health' of the system yet, before we look at the liabilities breakdown. So deposits then. Shall we start at private sector deposits? Total private sector deposits in the system of all banks operating in Ireland have declined from €166,152mln in August to €163,992mln in September (down 1.3% mom), the same deposits are down 6.43% (or -€11,267mln) yoy. 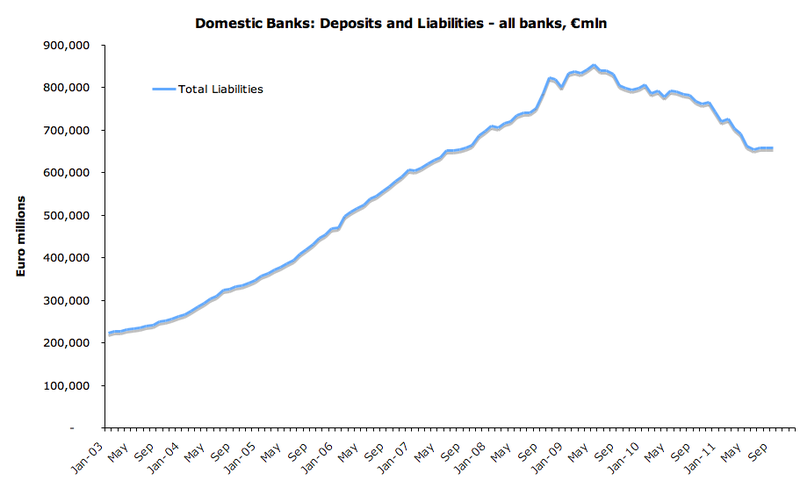 July-September average deposits in the system were 1.59% (€2,679mln) below those for 3 months between April and June 2011. So by all metrics here, the system deposits are shrinking. 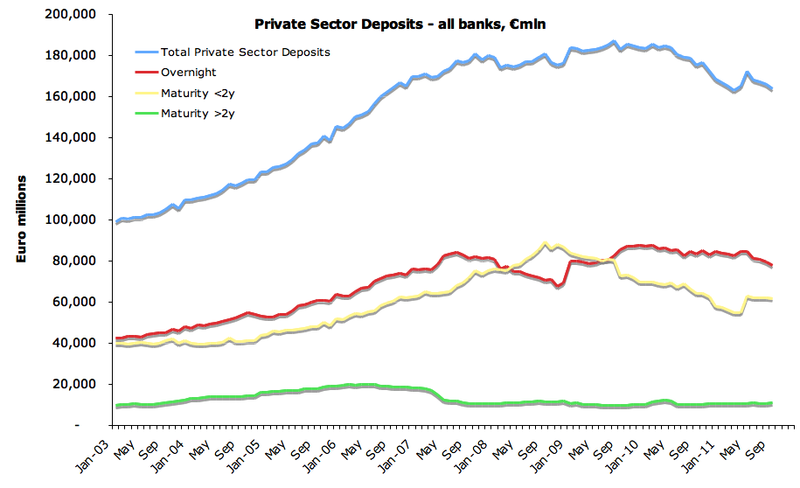 This shrinking is captured by declines in overnight deposits and deposits with maturity of less than 2 years. Deposits with maturity over 2 years have increased from €10,843mln in August to €10,946mln in September, marking second consecutive monthly increase, this time around - by a whooping 0.12%. Yes, that's right, the first time we discover anything of an increase is in the smallest sub-component of deposits and that is a massive 0.12%. MFIs (inter-banks etc) deposits were up in August (celebration time, folks) from €101,780mln in August to €103,293mln in September. Impressed? That was 1.49% mom rise, that is contrasted by a 23.32% decline yoy. So in a year we lost €31,419mln in interbank deposits and gained €1,515mln in a month. 20 months left to go till we are back at September 2010 levels. Or relative to peak - we are now €48,066 mln down - so only 32 more months of celebrated increases to regain the peak. Oh, another thing that drove our total system deposits up in September compared to August was an increase in Government deposits from €2,360mln in August to €2,740 in September. 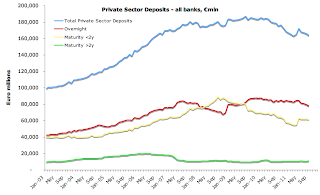 Private sector deposits - the real economy in Ireland - have declined in September to €142,828mln - down 14% or €23,252mln yoy and 1.15% or €1,668mln mom. 3 months through September average private sector deposits were 4.44% or €6,720 mln below the average for 3 months through July 2011. Overall across the Domestic Banking Sector, LTD ratios have declined from 145.32% to 145.14% between August and September. The rate of decline that would require 182 months to deliver 125.5% benchmark for stability envisioned under CBofI reforms (note: the benchmark of course does not apply to all Domestic Group banks, just to IRL6, but nonetheless, this can be seen as a comparative metric). Year on year the ratio is up 7 percentage points. In the private sector, the LTD ratio actually rose in September to 165.2% from 163.06% in August. Year on year the ratio rose 4 percentage points. So in summary - there are no signs that things are improving or stabilizing in the broader banking sector in Ireland. 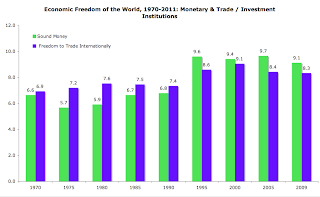 The following post will look into IRL6 guaranteed institutions, but as the whole banking system goes, no confidence gained, private sector deposits are continuing to contract, LTD ratio is rising for private sector and the only area of improvement is the inter-bank deposits, which means close to diddly nothing to the economy at large. Oh, and yes, you read it right - Japan and Euro area are the two drop-outs from global growth picture since 1995. Then again, the dropping-out became even more pronounced in the current crisis. 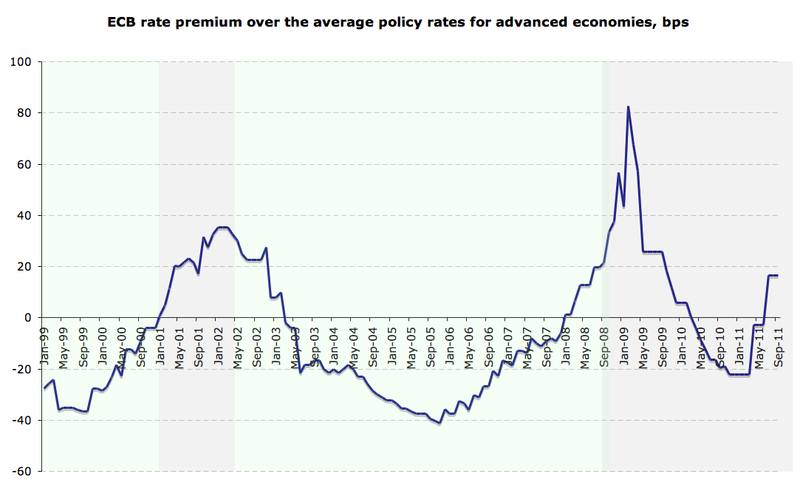 So all that price-stability... hmmm... it really pays off. 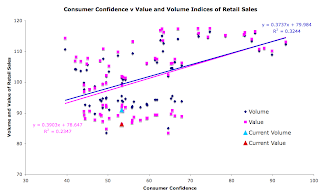 Retail sales data for September, released by CSO today allows us to update the series for consumer confidence and my own retail sector activity index which is a weighted average of Volume and Value of Sales and Consumer Confidence, normalized to 100=January 2005. 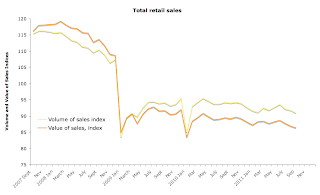 The Retail Sales Activity Index has now broken through the previous moderation range and surprised to the downside with a sharper downturn in September 2011. Index reading currently stands at 97.1 or 2.9 percentage points below January 2005. Compared to Q2 2011, Q3 2011 reading is 3.4% down and mom the index is down 1.7%. Year on year, RSAI is down 1.9%. 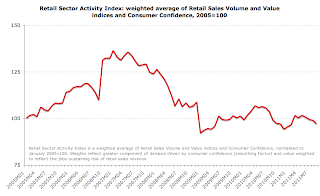 This is a new index, so some data 'bugs' can be expected, but the index weights are based on long-term multi-factor model relating activity in the sector as measured by Volume and Value of retail sales, linked to employment and consumer confidence. 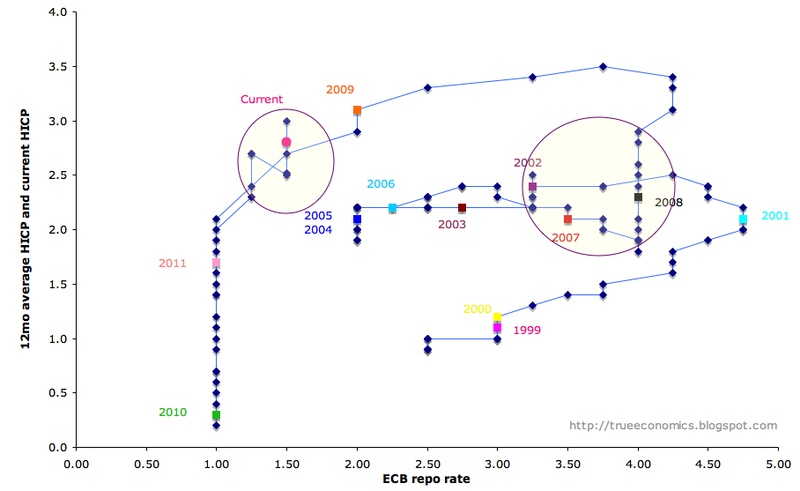 For pre-crisis 2006-2007, RSAI averaged 125.3, while in the last 6 months the average was 99.6. 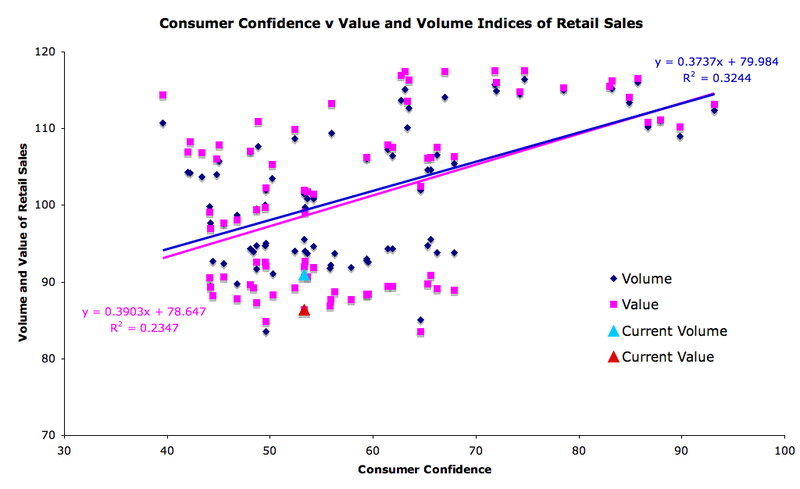 Speaking of consumer confidence, chart below shows that current readings for both Value and Volume of retail sales are still below their long-term equilibrium relationship consistent with consumer confidence. 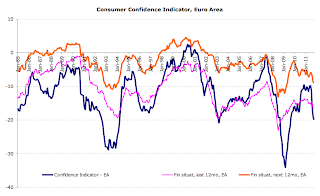 In other words, for as bad as the latest retail sales activity is, Consumer Confidence Index continues to provide relatively upbeat sentiment reflection. 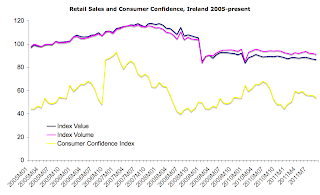 Consumer Confidence (ESRI) indicator is now at 53.3 for September 2011, down from 55.8 in August and the lowest reading since February 2011. 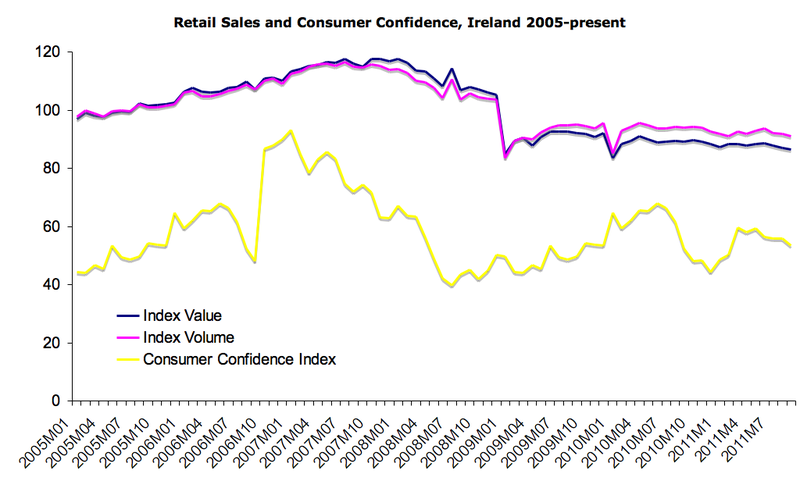 Consumer Confidence indicator for September was 4.5% below August reading, but 1.7% above September 2010 reading. 6mo average for CCI now stands at 56.4 against 2006-2007 average of 72.5. Q3 CCI was 5.3% below Q2 CCI. Retail sales for September came in with a major disappointment with a drop of 0.8% in Volume and an annual decline of 2.9%. 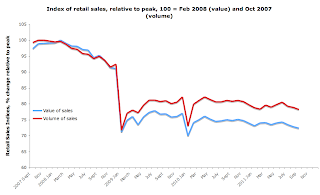 The Value of retail sales fell 0.6% mom and declined 3.3% yoy. 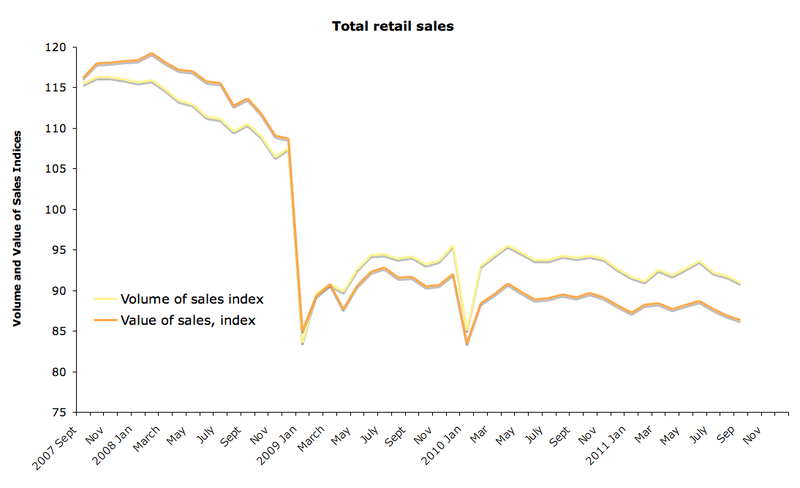 Given catastrophic collapse of the retail sales through the crisis to-date, the latest figures are grim. Value of retail sales (seasonally adjusted) is now below 3mo average of 87 (September reading is 86.4) and below 6mo average of 87.6. 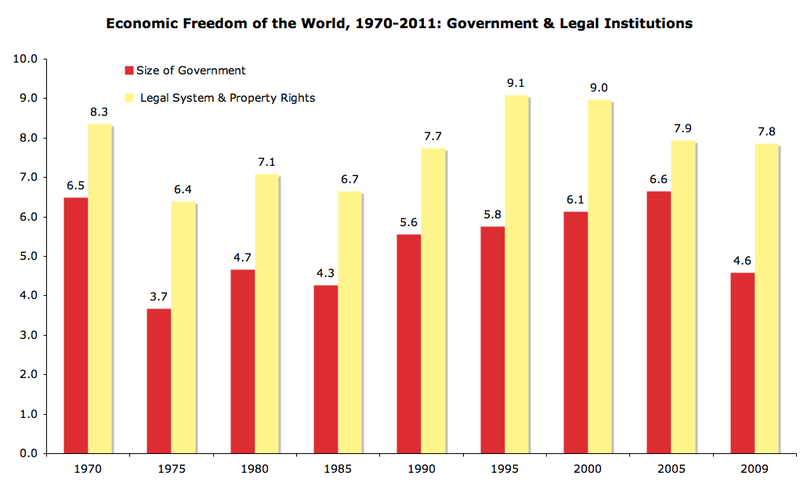 In comparison, 2010 annual average is 88.8 and 2011 average to-date is 87.7. 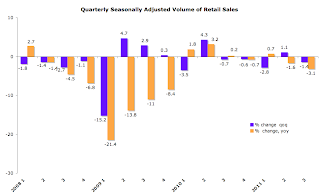 Volume of retail sales is now running at 91.0 against 3mo average of 91.7 and 6mo average of 92.2. 2010 annual average is 93.3 against 2011 average to-date of 92.1. Things are bleak across the board. 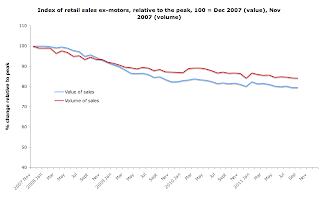 Relative to peak (chart below), Value of retail sales is now down 25.6% and Volume is down 21.2%. 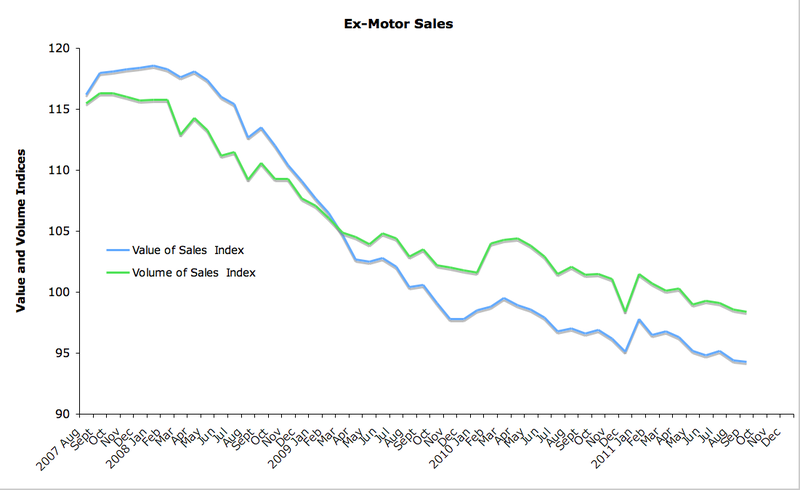 Ex-motors - core - retail sales declined 0.2% mom and fell 3.4% yoy in Volume, in Value there was a monthly decrease of 0.1% and an annual decrease of 2.4%. Relative to peak, core sales are now down 20.4% in Value and 15.0% in Volume. 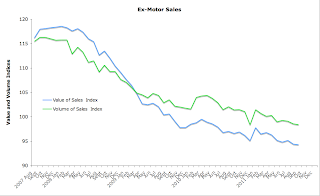 3mo average for Value of core sales is now at 94.6 against September reading of 94.3 and 2010 average is at 97.6 against 2011 to-date average of 95.7. For Volume, 3mo average is 98.7 against the current reading of 98.4 and 2010 average is 102.3 against 2011 to-date average of 99.7. 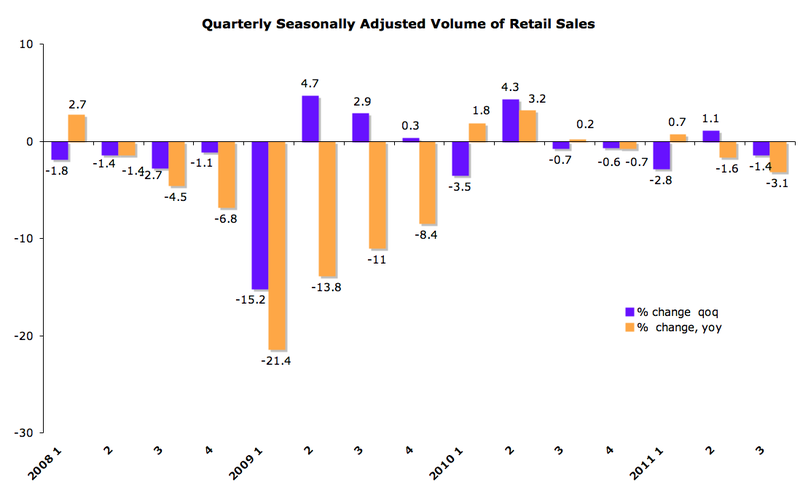 Quarterly series movements are showing substantial strain on retail sales, as detailed in the charts below. (+2.7%), Department Stores (+0.3%), Oher Retail Sales (+0.5%) and Non Specialised Stores (+0.2%) in the volume of retail sales. 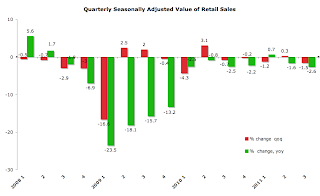 Furniture & Lighting (-4.2%), Motor Trades (-3.4%) and Food Beverages and Tobacco (-2.8%) were amongst the categories that showed month-on-month decreases in the volume of retail sales." 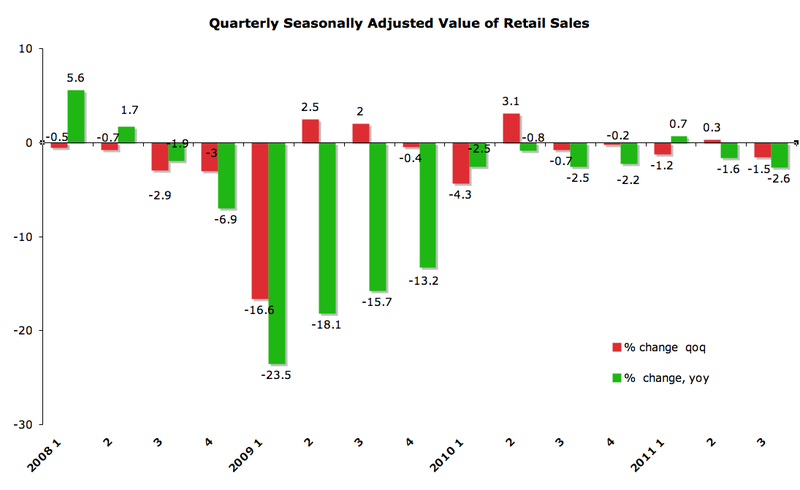 Overall, in terms of Value of sales only 2 categories of sales posted yoy increases in September: Non-Specialized Stores (ex Department Stores) and Fuel. In terms of Volume only electrical goods (+3.2%) posted a yoy increase. 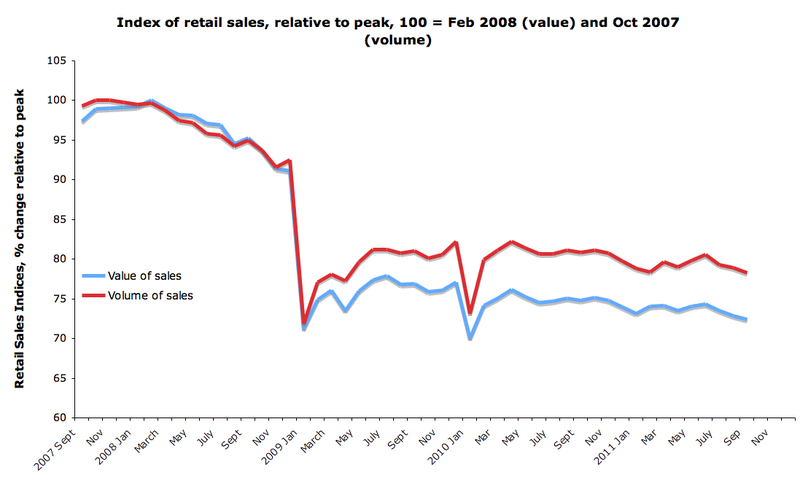 In August 2011 (latest data available) Ireland recorded 6th largest yoy contraction in retail sales in EU27. 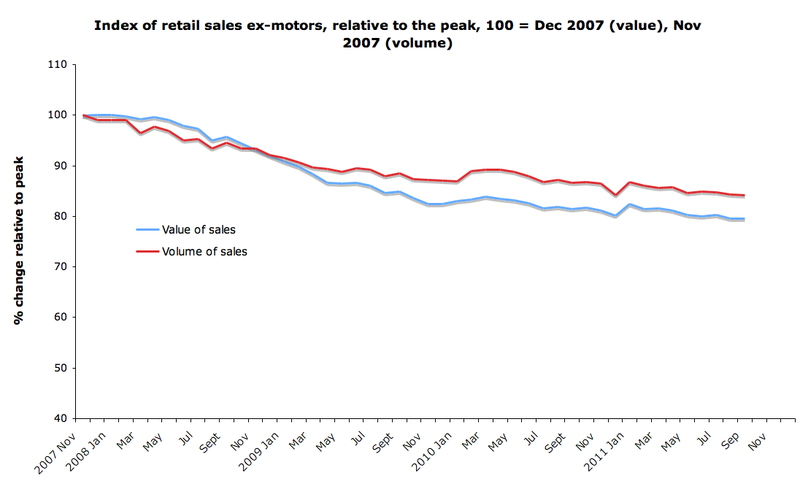 In July 2011 we were the 8th worst performing economy in terms of retail sales. But fear not, allegedly, exports of Viagra etc are going to replace all the jobs being lost in the retail sector as soon as we've turned another corner. 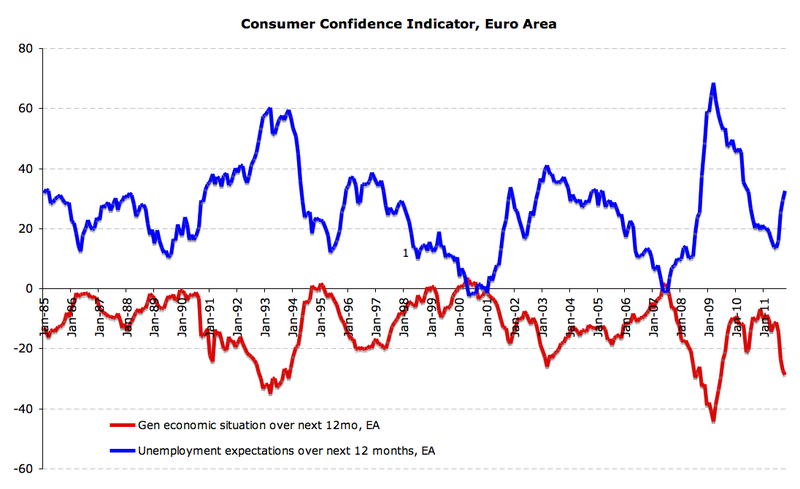 Euro area leading indicator for economic activity, Eurocoin, has crossed into contraction territory in October. 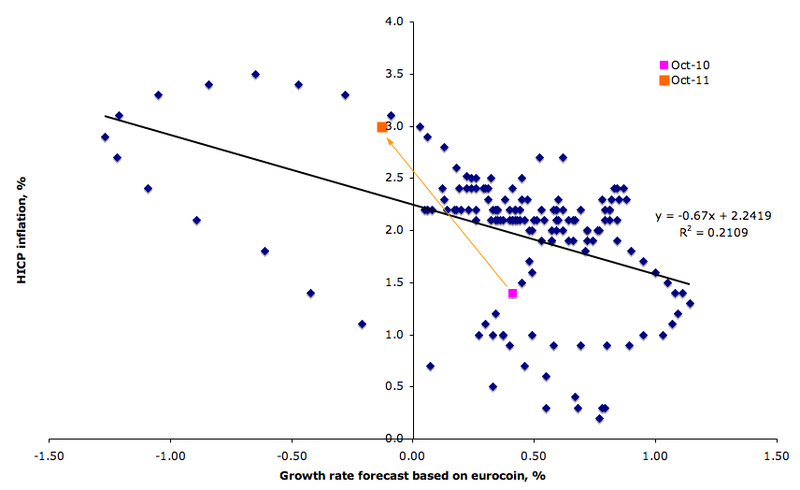 Based on the latest data from CEPR, Eurocoin is now at -0.13%, with corresponding quarterly growth rate of between 0% and -0.05%, signaling the likelihood of a recession for the euro area as a whole. 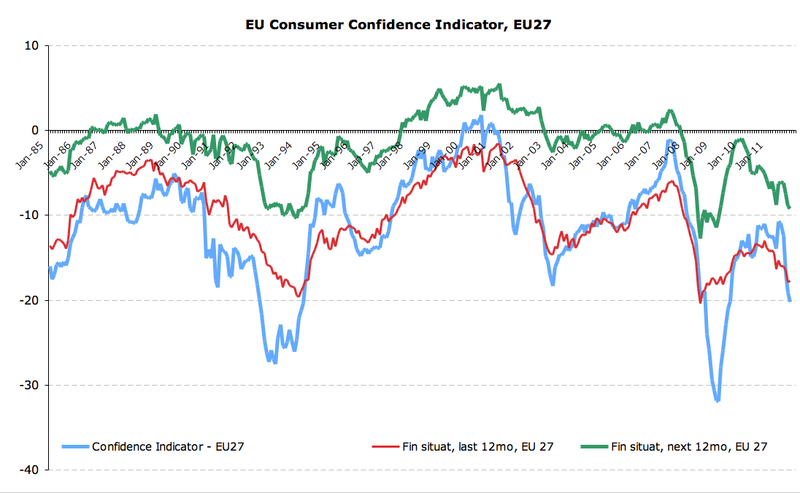 We are now at the lowest reading since August 2009 when Eurocoin stood at -0.21% moving to the upside in September 2009. Eurcoin 3mo average is now at 0.04% and 6 mo average at 0.285%. Year on year Eurocoin has dropped 132%. 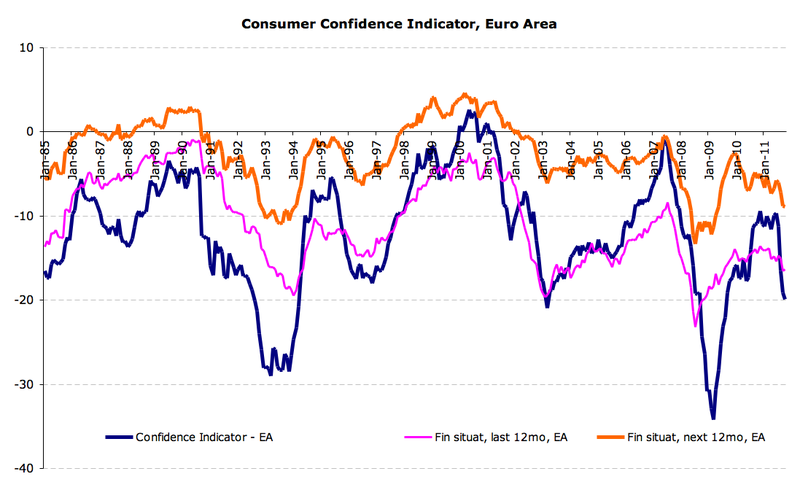 Per CEPR: "The fall is the result of deterioration in most of the variables that are included in the indicator, and in particular of the worsening climate of confidence among firms and consumers." 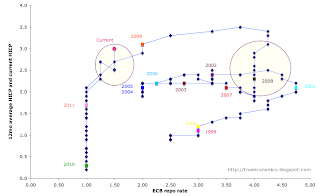 Worsening Eurocoin now signals Taylor rule divergence for the future direction in the interest rates, as illustrated in charts below. Inflation-consistent rates are in the 3%+ territory, while growth-consistent rates are in the range of at or below 2%. For US MNCs operating in Ireland this will serve as a powerful incentive to on-shore profits accumulated in Ireland. While the full impact is impossible to gauge - it is likely to be significant, running into 50% plus of retained earnings. This will, in turn, translate into higher Net Income Outflows from Ireland (see QNA) and thus directly depress our Gross National Product. 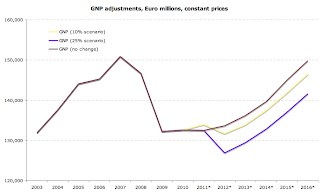 I run two scenarios - based on IMF WEO (September 2011) forecasts for Irish GDP, current account and Government expenditure and on historical data from CSO QNA. The baseline scenario assumed that MNCs will expatriate the same share of their profits relative to GDP as they have done before (3 year moving average). The first adjustment scenario adds a 10% uplift on the above scenario and expected growth in GDP to repatriation of profits. The second adjustment scenario adds a 25% uplift. The results are in the charts below. Pretty dramatic. And this is for rather conservative assumption on increased outflows. 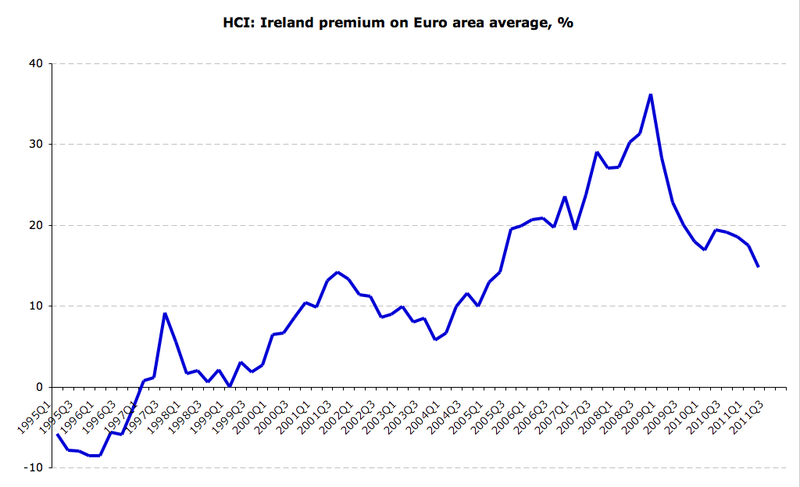 In fact, price stability at 2% target for HICP would require current ECB rates to be in the neighborhood of 2.5-2.75%. 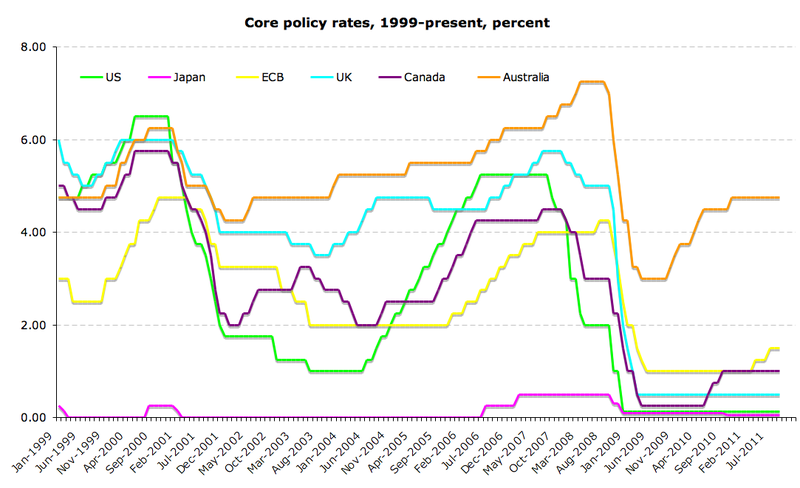 And note from the second chart below - of all major central banks, ECB is the only one to have raised rates since November 2010. 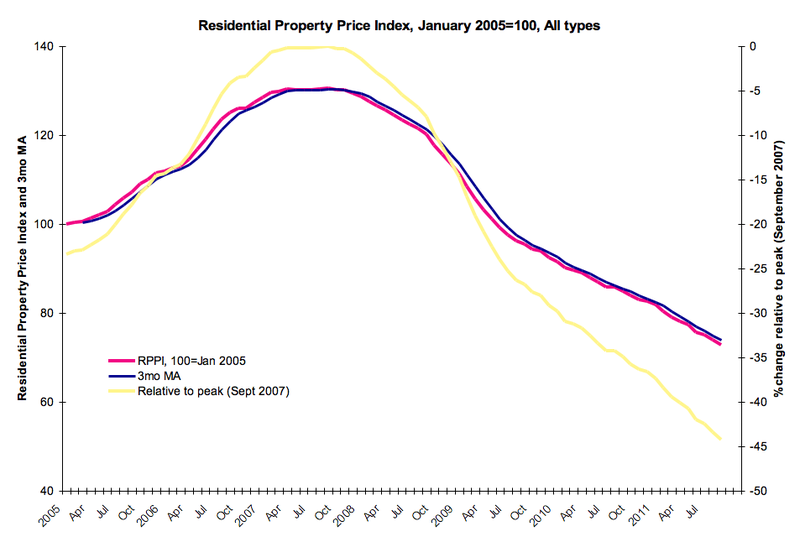 According to CSO Residential Property Prices index, September 2007 saw the historical peak in prices for overall RPPI at 130.5. 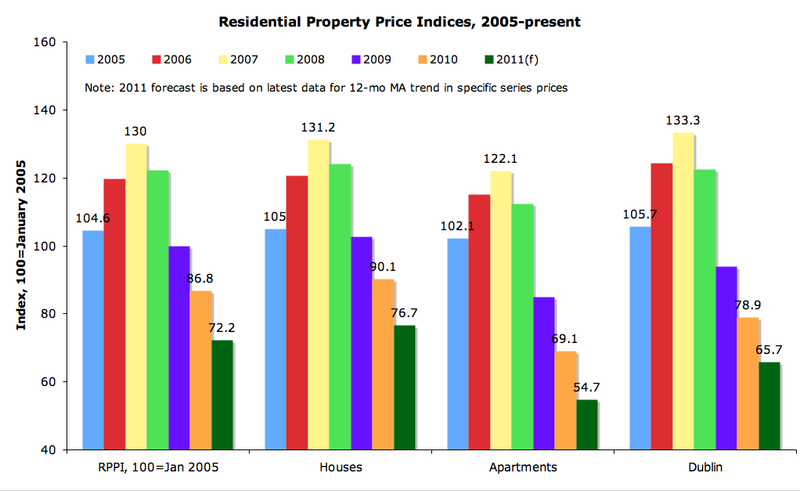 Today's data shows that the index now stands at 72.8, implying that property prices have fallen nationwide by 44.2% on average since 4 years ago. Miserable news. 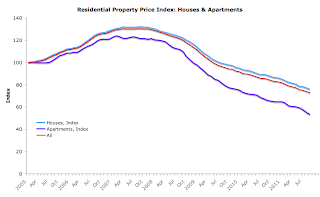 Now, September RPPI for all properties has fallen 1.49% mom and 14.25% yoy, exceeding (in terms of fall) analysts expectations for 13.4% decline. 12mo MA of monthly declines now stands at 1.27% and year-to-date average monthly decline is at 1.41%. Relative to Nama's cut-off valuation date of November 30, 2009, factoring in average LTEV uplift of 10%, Nama residential properties-linked assets portfolio is now on average 29.52% under water. Factoring 5% burden-sharing (subordinated bonds), the downside is now 26.2% which means that Nama will need a lift-up of 35% on current values to break even. For Houses, nationwide, RPPI fell to 76 in September from 77 in August a decline of 1.3% mom and 13.93% yoy. The index is now down 42.4% on peak of 132 achieved in September 2007. Apartments sub-index is down to 53.2 in September from 54.9 in August, with mom contraction of 3.1% - the sharpest monthly decline since March. Yoy the sub-index is down 19.03% and relative to the peak of 123.9 (February 2007) the sub-index is down 57.06%. Nama holds loads of apartments, so applying the earlier assumptions on LTEV, Nama apartments-linked sub-portfolio is under water 36.9%, implying, net of subordinated bonds, a 33.9% decline in valuations to November 2009 cut-off date. 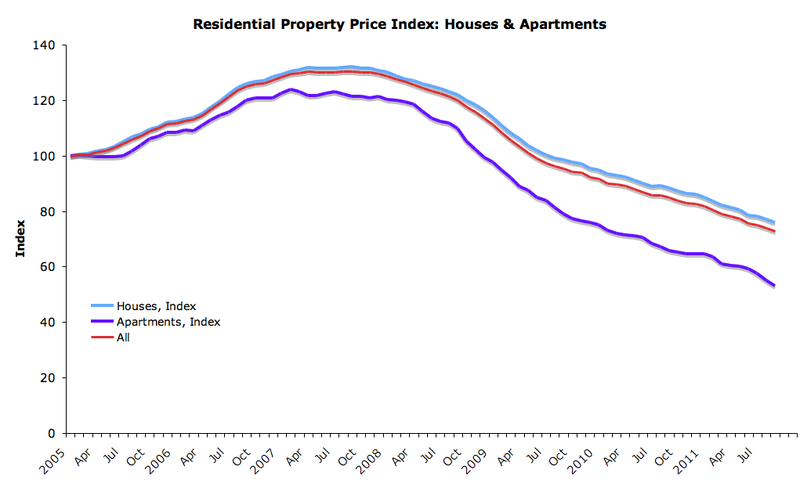 This suggests an average required uplift in apartments prices of 55.12% for break-even. 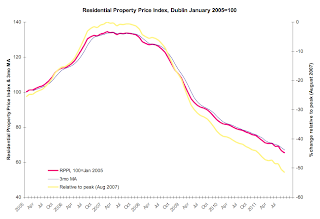 Dublin properties prices are now 51.6% off their peak, with sub-index for Dublin declining to 65.1 in September from 66.5 in August - a drop of 2.11% mom and 15.56% yoy. 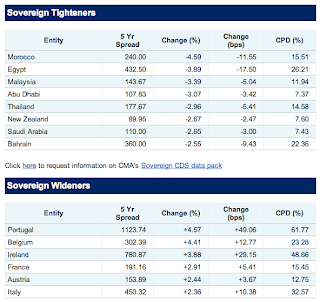 24/10/2011: Euro CDS disaster Redux? 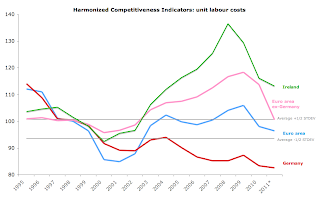 Chart above shows that euro area HCI (unit labour cost adjusted) have deteriorated (higher values in the graphs reflect lower competitiveness) from 96.4 in Q1 2011 to 99.2 in Q2 2011. Q2 2011 reading was 2.5% above Q2 2010 reading, but 6% below Q2 2009 reading. 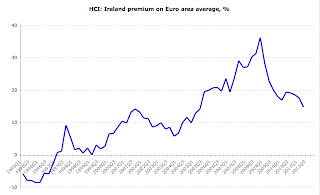 Relative to Germany, euro area HCI(ulc) index now stands at 17.4% premium, reflecting relatively much stronger competitiveness of German economy. 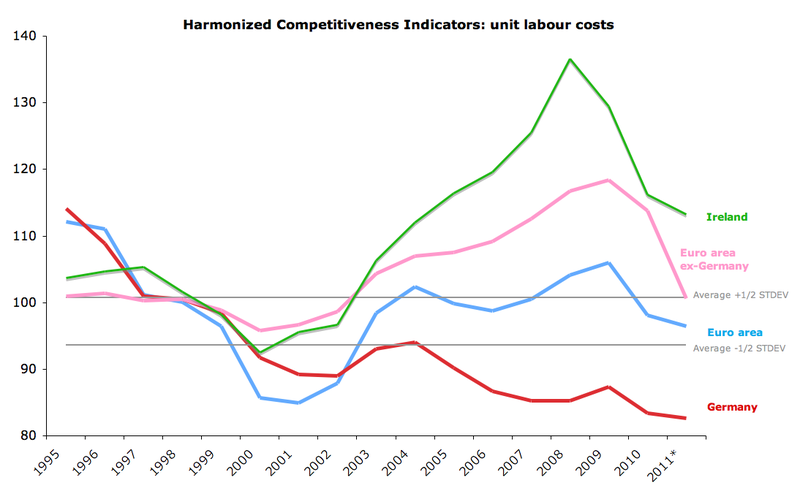 Germany's HCI(ulc) rose from 82.6 in Q1 2011 to 84.5 in Q2 2011, marking deterioration in competitiveness qoq. Year on year, index is not 3% higher, and the gains in competitiveness since 2009 have been virtually erased, as Q2 2011 index reading is just 0.3% below Q3 2009 reading. However, Germany remains the most competitive economy in the euro area in terms of HCI(ulc) index with own index reading currently 14.8% below euro area overall index. 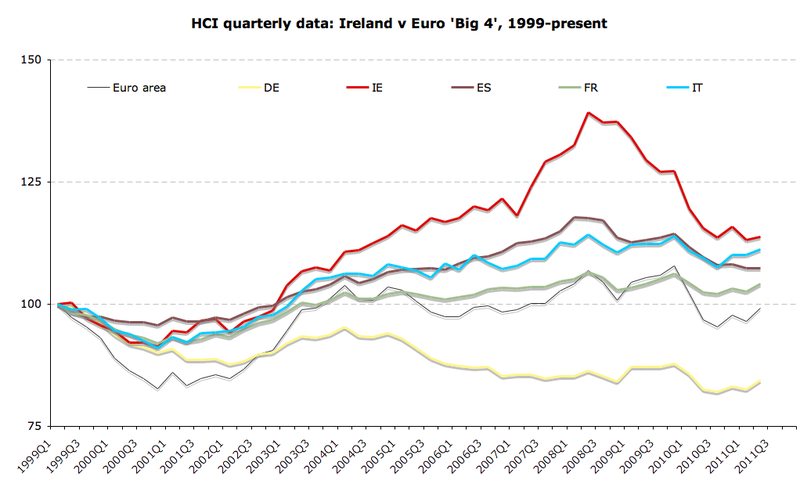 Spain's HCI(ulc) was virtually unchanged, rising from 107.3 in Q1 2011 to 107.4 in Q2 2011. Spain's competitiveness index has fallen (improved) by 2.0% yoy in Q2 2011 and is down 5.0% on same period 2009. 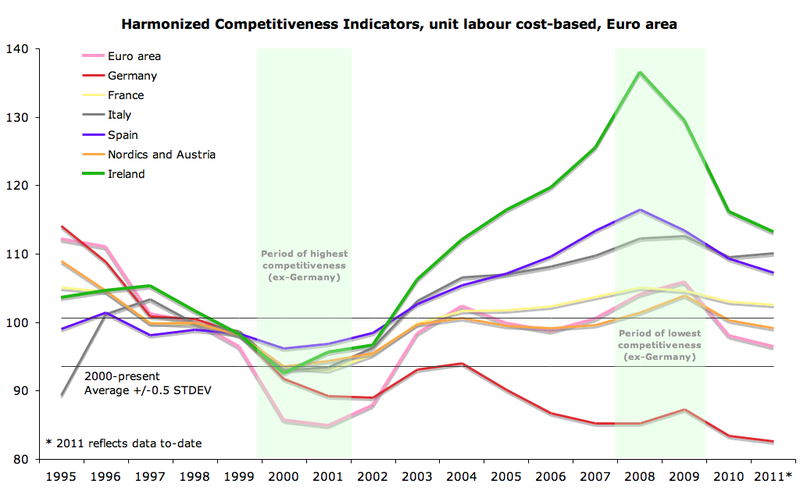 Spain remains 8.3% less competitive than the euro area and 27.1% less competitive than Germany. France's HCI(ulc) deteriorated from 102.6 in Q1 2011 to 104.2 in Q2 2011, rising (deteriorating competitiveness) 1.8% yoy and 0.1% no Q2 2009. 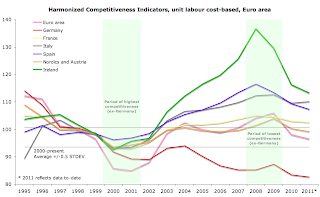 Relative to Germany, France is 23.3% less competitive in terms of HCI(ulc) and 5% less competitive than euro area. 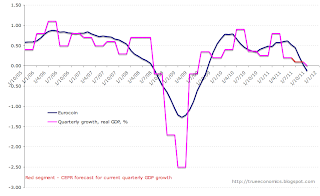 Italy's HCI deteriorated from 110.1 in Q1 2011 to 111.2 in Q2 2011, rising (deteriorating competitiveness) 1.65% yoy and improving (falling) 1% on Q2 2009. Relative to Germany, Italy's HCI is now at 31.6% premium (poorer competitiveness) and Italy is 12.1% less competitive than euro area average. 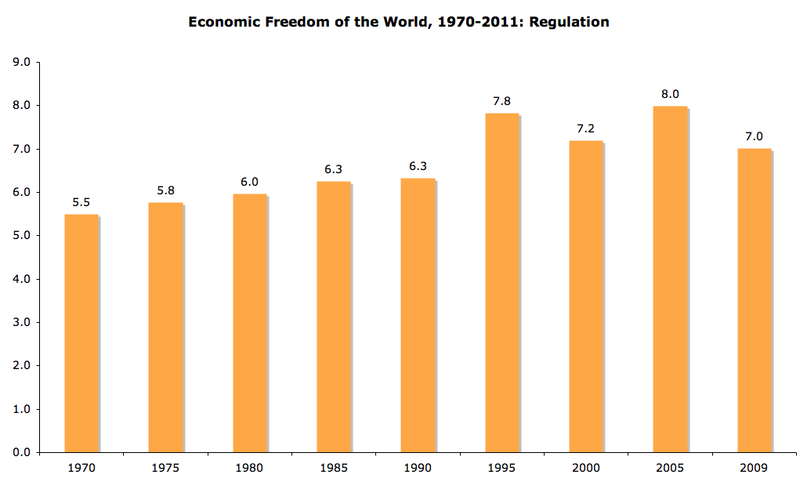 Smaller economies are charted above. 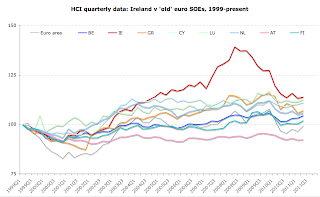 For Ireland, HCI(ulc) also posted deterioration in Q2 2011 rising from 113.2 in Q1 2011 to 113.8 in Q2 2011, marking decline in Ireland's competitiveness as measured by HCI. 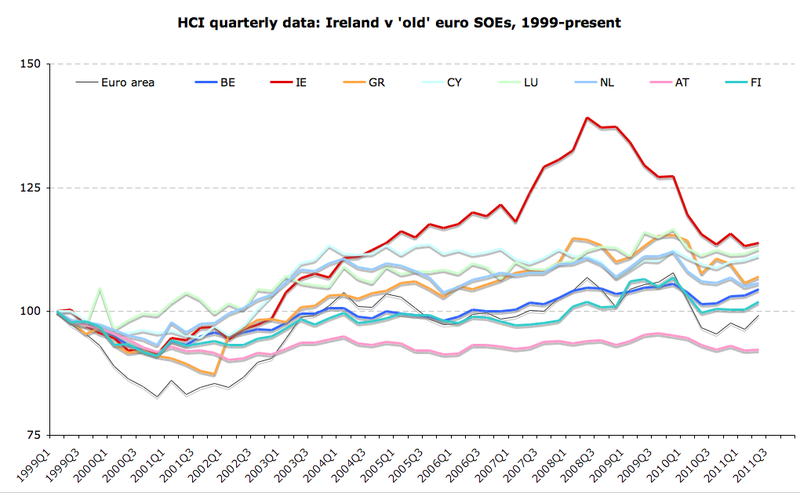 Ireland's competitiveness, however, improved yoy by 1.6% and is up on Q2 2009 level by 12.1%. Despite these gains, Ireland remains the least competitive 'old' euro area economy with Ireland's competitiveness gap of 34.7% compared to Germany and 14.7% compared to euro area. 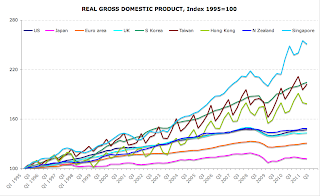 As I have noted on numerous occasions before, much of the gains in our competitiveness in 2009 can be explained by the wholesale destruction of less competitive sectors: construction and domestic services (retail, security etc). The concern is that our future competitiveness gains will be compressed by the fact that from here on, we will need much harder to attain productivity growth in remaining sectors. So far, some nascent costs inflation in other economies have helped us to continue improving compared to euro area average. But in absolute terms, it is clear that since Q2 2010 we have lost momentum in gains in HCI(ulc) measures. 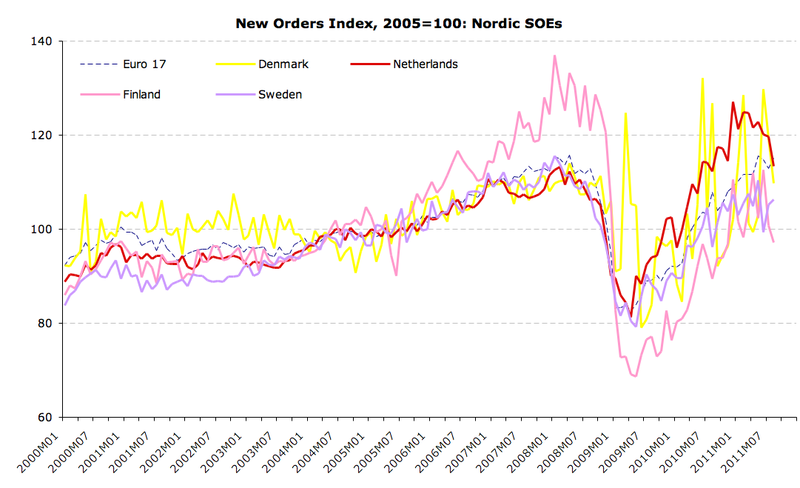 "In August 2011 compared with July 2011, the euro area (EA17) industrial new orders index rose by 1.9%. In July the index dropped by 1.6%. 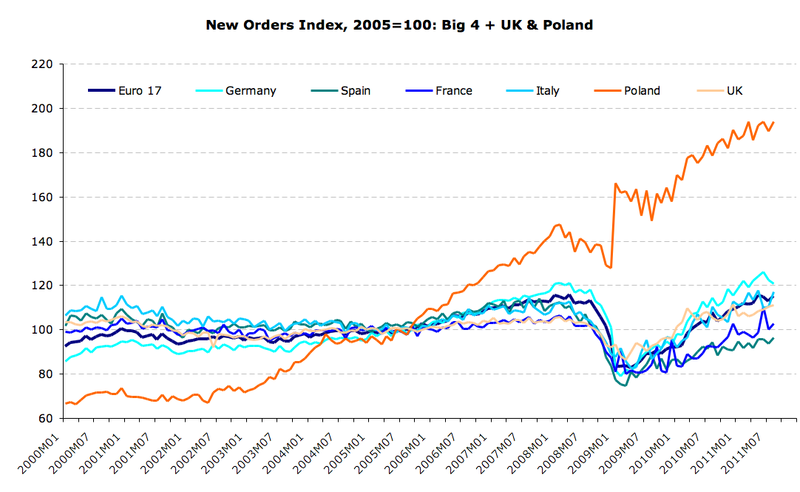 In the EU27 new orders increased by 0.4% in August 2011, after a fall of 0.6% in July. Excluding ships, railway & aerospace equipment, for which changes tend to be more volatile, industrial new orders rose by 0.7% in the euro area and by 0.5% in the EU27. In August 2011 compared with August 2010, industrial new orders increased by 6.2% in the euro area and by 6.5% in the EU27. Total industry excluding ships, railway & aerospace equipment rose by 5.0% and 5.2% respectively." 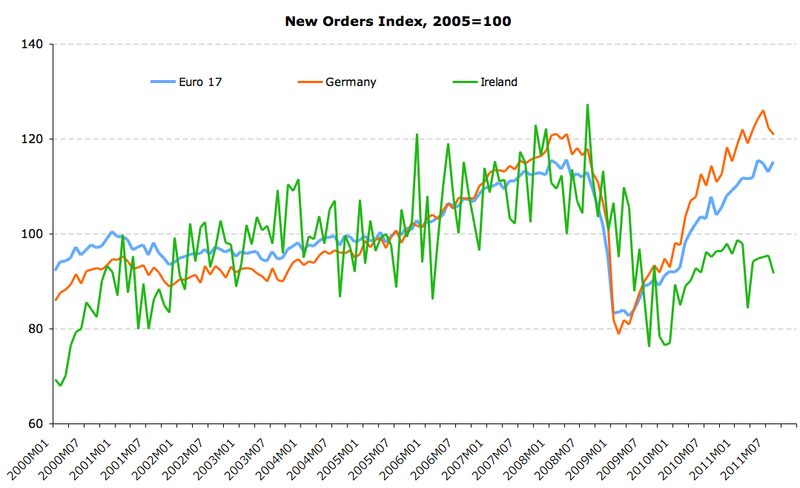 Start at the top: EU17 new orders index is now at 115.11 for August, up on 112.93 in July, down on 115.54 in May. The index is now back into the comfortable expansion territory, where it has been since April 2010. 2008 average reading was 110.09, 2009 average was 86.99 and 2010 annual average was 102.2. So far - through August - 2011 average is 112.93 - not a bad result. But miracle it is not - reading of 100 is consistent with activity back in H1 2005, so in effect, through August 2011 we have achieved growth of 2.05% annualized in terms of volumes of output. Given that since then we had pretty hefty doses of inputs inflation and moderate gate prices inflation, the margins on the current activity have to be much lower than for pre-crisis years. Which means relatively robust improvements in volumes of industrial new orders are not necessarily implying robust value added growth in the sector. Meanwhile, German new orders have shrunk in August 2011 from 122.4 in July to 120.9 in August. Month on month German new orders are down 8.04% and year on year activity is down 13.34%. This marks the lowest reading since April 2011. France posted an increase in new orders index to 102.90 in August from 100.1 in July. 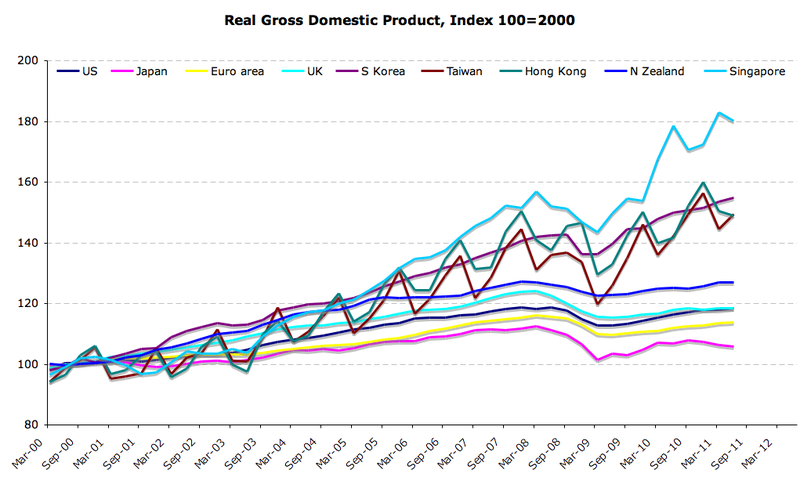 France's 2011 average to-date is 100.43, well ahead of 2010 average of 90.93 and 2009 average of 84.31. 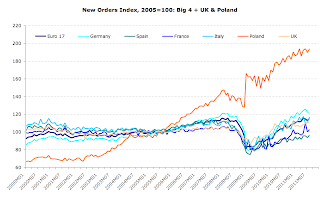 France's new orders index averaged 100.06 in 2008. Spain posted a surprising improvement in August to 96.43 from 93.85 in July and yoy rise of 2.0%. Spain's 2008 average was 102.93, 2009 average of 81.57 and 2010 average of 89.61. 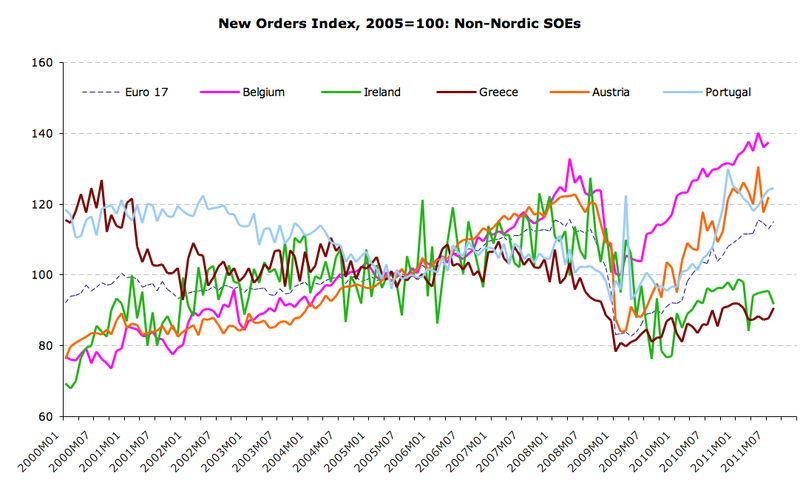 For 8 moths through August 2011, Spain's new orders index averaged 94.27. 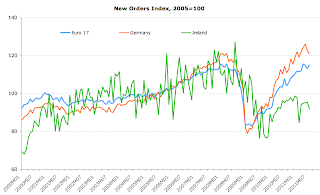 Italy;s new orders index hit 117.21 - very robust increase of 6.14% mom from 110.56 in July. 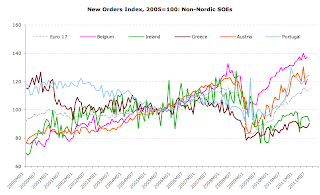 Italy's new orders index is now averaging 113.58 for eight months of 2011, up on 2010 annual average of 103.09, 2009 average of 89.75 and 2008 average of 104.59. It's worth noting that Italy exemplifies the fallacy of 'exports-led growth' argument - the country has posted very robust recovery in its significant and highly exports-oriented industrial sector, and yet it also posted virtually no growth over the last 2 years. Other countries are illustrated below. 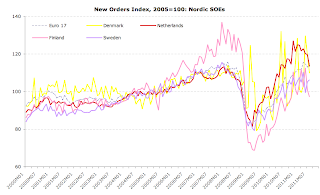 So on the net, industrial production new orders signal some bounce back from the troughs of the slowdown in early summer 2011, but this can be immaterial for the wider Euro area economic growth and a temporary improvement. 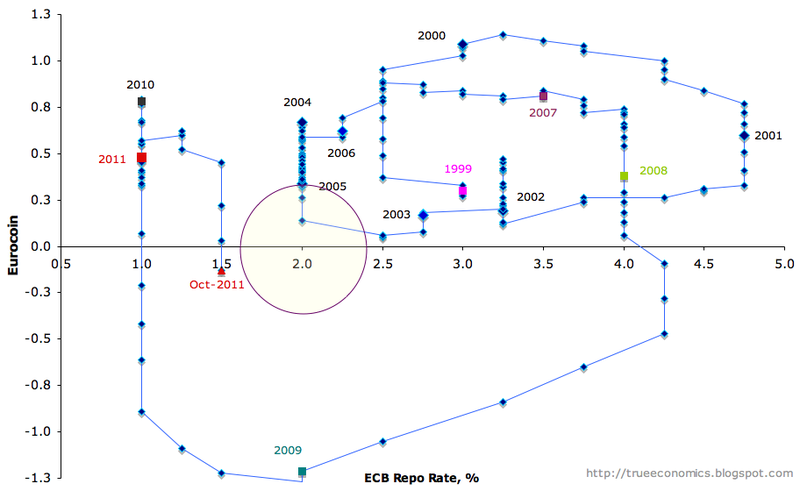 September and October data will be more crucial, signaling into early 2012. Second, a very good graphic from NYTime on debt-default interlinks globally: Chart 1 and an interactive version here. Third, some interesting points on global yield curves here. And lastly, a good summary of contagion dynamics from the zerohedge blog which roughly outlines the scenario that I presented on Friday, October 14th, at the American Bar Association meeting in Dublin - that of the inevitable destruction of the euro as we know it (either in composition or in its totality) - here. This is the unedited version of my article in Sunday Times (October 23, 2011). As the Troika gives another ‘thumbs up’ to our fiscal policies, the reality check on our medium term fiscal objectives suggests that the real cuts are yet to come. Staring into the barrel of the next budget, the Irish nation is now slowly, but surely coming around to the realization that the medicines for our twin malaise of unsustainable debt and deficit to-date not only failed to cure the disease, but instead made it virtually incurable. Now the fourth year into the austerity, per latest figures, Irish budget deficits for H1 2011 remain stuck above 13% of the country GDP. Taken against the more realistic metric, GNP, the shortfall between Exchequer spending and revenue is running at ca 17.6%. Even per Stability Programme Update, current expenditure – stripping out banks measures and capital investment, for 2011 is expected to run ahead of the 2010 levels. Austerity, to-date, has been visible solely in capital investment cut backs and tax increases on personal incomes of the households. The rest of the ‘savings’ are really a game of shells – shifting expenditure from one side of the balance sheet to the other. In medical terminology, courtesy of the Irish Government choices of policy tools, our economy is now like a body consuming itself from the inside. Quarterly National Accounts clearly show that Gross Fixed Capital formation in the economy is no longer sufficient to cover amortization and depreciation on private and public capital stocks accumulated between 2004 and 2008. Meanwhile, in nine month through September this year, income tax alone accounted for 38.4% of the entire Government tax revenues, up from 28.4% for the same period of 2007. 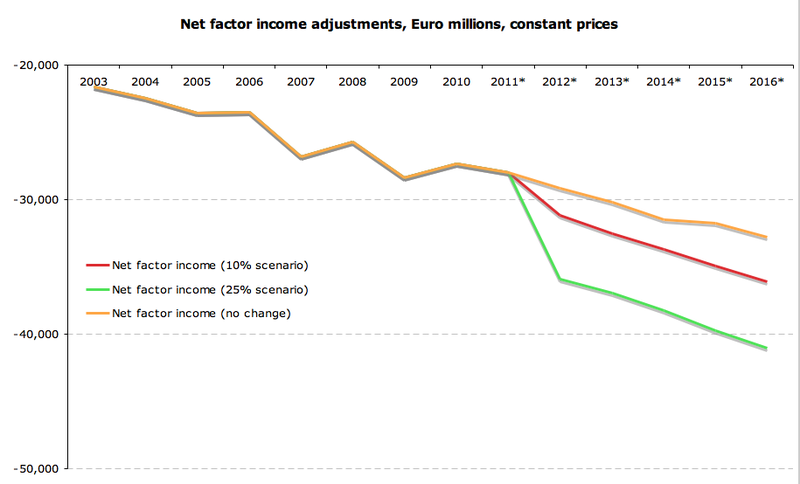 Taking out tax increases, Irish Government austerity has delivered no real, long-term changes to-date. Neither public sector pensions, nor numbers employed, nor public wages paid relative to comparable grades in the private sector have seen much of a change worth talking about. Adding more injury to the economy, tax increases have been concentrated at the top of earnings distribution, creating in effect the unsustainable environment where by our exports-oriented, higher value-added economy is being starved of the main input into its activity – human capital. In 2009, Irish residents earning ca €58,000 and above, faced an average income and social security tax burden of 39.9% - ahead of the OECD average of 39.4%. The OECD average tax calculations do not adjust for the fact that whilst in Ireland income tax and social security levies and charges yield no tax-specific benefits, in other countries, social security charges include payments into private pensions and insurance funds. After Budgets 2010 and 2011, and adjusting for private pensions and health insurance contributions, this figure has most likely risen to above 45%. Lacking competitively priced access to early education, childcare, healthcare and transport services taken for granted in other European member states, Ireland has now lost its competitive edge in attracting, retaining and developing skills needed for successful growth of our core modern sectors: research-intensive pharma, biotech and ICT, and skills-intensive international financial and legal services, business analytics and creative industries. All of this means two things for the forthcoming Budget 2012 and for the medium term budgetary framework. Firstly, to restore Irish public finances back to health, the next four budgets will require dramatic cuts in the current public spending. Second, there is no room for new tax revenue measures. Any further increases in taxation even at the lower end of the earnings spectrum will increase effective tax burden on highly skilled workers. This will act to further undermine our economy’s competitiveness in the core growth areas of the skills and knowledge-intensive sectors. The problem is not a trivial one. Currently, there are between 3,500 and 5,000 vacancies in the ICT sector alone that cannot be filled by indigenous and multinational employers in Ireland. Despite the fact that ICT workers have the highest private sector average earnings of all sub-sectors in Ireland and enjoy average earnings almost 20% above their EU counterparts, companies cannot fill these vacancies. The reason is simple – we are not competitive, compared to our European counterparts, when it comes to the value for money that our after-tax earnings provide. And this problem is not restricted to ICT sector. In the last two months at least seven internationally competitive researchers previously working in top Irish universities and institutes have packed their bags and moved overseas, leaving highly paid positions to seek better value for money and career opportunities abroad. The next Budget must, therefore, address the problem of current spending overhang by cutting into the most painful areas of spending: social welfare, education, health and public sector employment bills. Education-related spending has remained constant over the years of this crisis, accounting for ca 18% of the total budgetary allocations in the nine months through September 2008 and in the same period of 2011. 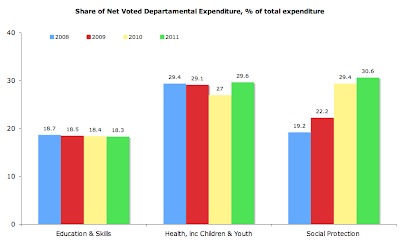 Department of Health share of total expenditure has risen from 27.9% in 2008 to 30% in the nine months through September 2011. Social Protection share rose from 19% in 2008 to over 30% so far this year. 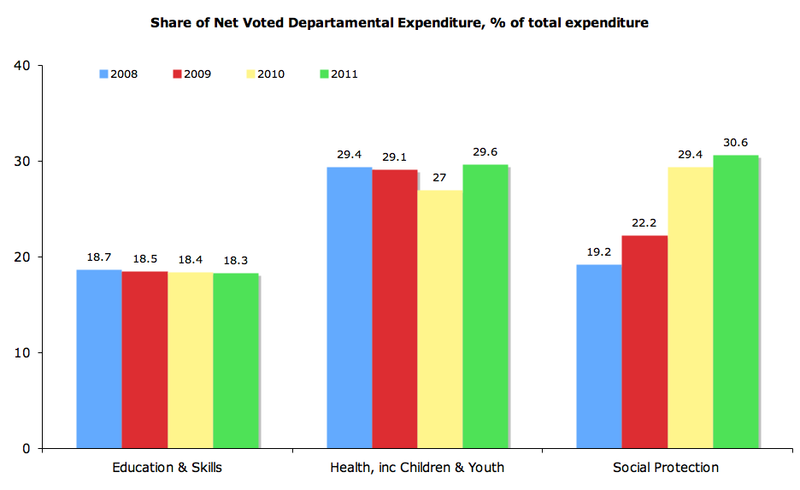 Combined, three top spending heads accounted for almost 79% of the total voted expenditure by the State in 2011 to-date. Year on year, for the period of nine months through September 2011, there has been zero change in Education spending, a 10% increase in Health spending and a 4% increase in Social Protection. Any serious effort at fiscal austerity requires much more dramatic cuts in these three departments. Combined deficit reduction measures between 2012 and 2015, envisioned by the agreement with the Troika add up to €11.8 billion. Last week, the Fiscal Council has correctly proposed revising this figure up to €15.8 billion, to be delivered with €4.4 billion adjustment in 2012 and €3.7-3.9 billion every year thereafter. In my view, the measures are not front-loaded enough. In my view, Ireland’s economy will require €5.0-5.5 billion adjustment in deficits in 2012 and 2013, followed by €3.5 billion in cuts in 2014 and a €2 billion or less cut in 2015 to the total target for deficits reduction of €16-16.5 billion. Such frontloading of cuts is required to control for the risk of further economic slowdown in 2012-2015, with 1% reduction in nominal growth rate potentially leading to a debt/GDP ratio deterioration to above 120% and even more dramatic decline in debt sustainability as measured against GNP. 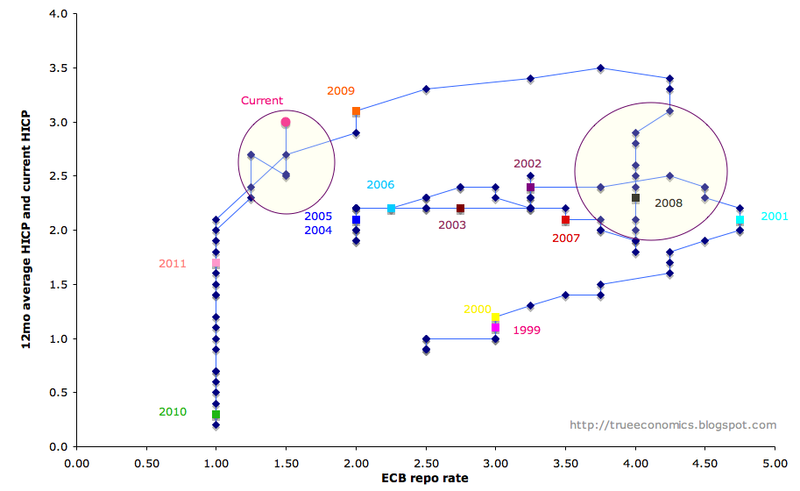 Frontloading is also need to provide a buffer against the expected increases in interest rates in post-2013 environment. 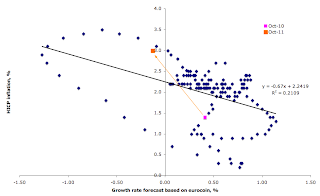 Current inflation rates and growth dynamics within the euro area imply optimal ECB rates in excess of 2.5%. 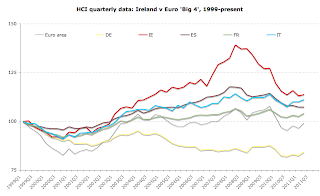 2012-2015 period is likely to see significant increases in ECB rates, leading to an uplift in overall debt financing burden for companies and households in Ireland. With Ireland’s private sectors debt well in excess of the majority of our euro area counterparts, imposing more austerity in later period of fiscal adjustment can risk coinciding with the period of reduced private debt affordability and lead to a simultaneous adverse shocks to growth. Lastly, frontloaded cuts will act to rebalance future growth expectations for 2014-2015, helping to restore some investment activity in the economy. 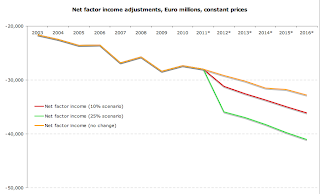 Of the above measures, only about €3.5-3.7 billion can be expected to come from increased tax revenues driven by organic growth in economic activity not new taxes. No more than €1.2-1.5 billion more in savings can be generated by cutting deeper into capital expenditure. This means that the Government must find some €11-12 billion in current spending cuts over the next four years. Spread across current weights of specific top spending heads, this implies cuts of €2 billion in Education, and ca €3.3 billion in Health and Social Protection, each. Much of these cuts will have to come from involuntary redundancies and possibly cuts to indexation awarded previously for existent public sector pensions. If management is doing things right, and leadership is doing the right things, as Peter Drucker remarked, Ireland’s Government has no choice but exercise both in the forthcoming Budget. The latest European Commission proposals for banning credit ratings changes for euro countries applying for EFSF or IMF rescue funds is the embodiment of the complete detachment of the European leadership from the realities of financial markets. Instead of dealing with the pressing issues of spreading contagion, the EU Commission has largely remained in its usual modus operandi since the beginning of the sovereign debt crisis, seeking new and ever-more elaborate means for raising new taxes, banning markets activities that actually act to increase markets transparency and efficiency, such as short-selling and independent ratings, while issuing vast encycliae on economic growth, invariably based on some new subsidies, state supports and other markets distortions. As with other ‘measures’, the latest proposal can backfire spectacularly. Rating agencies, only recently burned by their own failures to properly assess risks of complex securitized products relating to the US mortgage loans, have been rebuilding their reputations by re-asserting independence and pushing stronger ratings discipline through. In the presence of the ban, off-shored rating functions will be more likely to more severely downgrade euro area sovereigns seeking emergency funding, just to show the markets their own models robustness. Someone should tell the EU Commission that spitting into the hurricane wind might not be such a good idea. 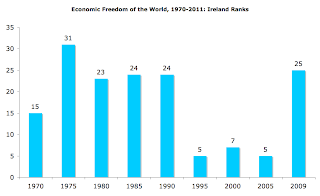 Couple of weeks ago, Ireland's Open Republic Institute and Canada's Fraser Institute published annual Economic Freedom of the World Index - the most comprehensive and academically credible index of institutional quality of economic environments around the world. Unlike other similar indices, EFW uses latest comprable available data for all countries in the index and undertakes detailed assessment of the largest number of criteria in arriving at its final rankings. The results for Ireland are not good. As well as for Europe overall. No EU countries in top 5 ranks, only one EU country in top 10 and no Euro area country in top 10. In top 20 ranked countries group, there are only 3 Euro area core EU countries, with 3 more Central and Eastern European states. Ireland ranks only 25th in the world - an extremely poor performance, given that last year we were ranked 11th and in 2009 index we were ranked 9th. We are now ranked back in the position that is consistent with economic environment-determining institutions quality that is worse than the entire 1980s! 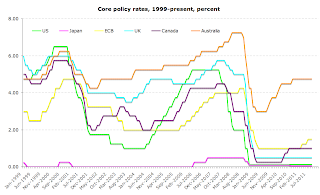 The data above refers to performance parameters for 2009. Since then, Irish economic conditions and policies have deteriorated substantially so we can expect further downgrades in the index.